We just celebrated our third anniversary living and traveling fulltime in our motorhome and can say with all honesty that we have no regrets and don't miss anything about owning a "stick house" (with the small exception of constant high speed internet). We are still having just as much fun as we did when we first hit the road. But we realize that at some point in the future we will choose to "settle down". We are also well aware that our circumstances could change in such a way that prevents us from continuing to be "Nomads". However, until that day comes we will continue to be grateful for everyday we have. 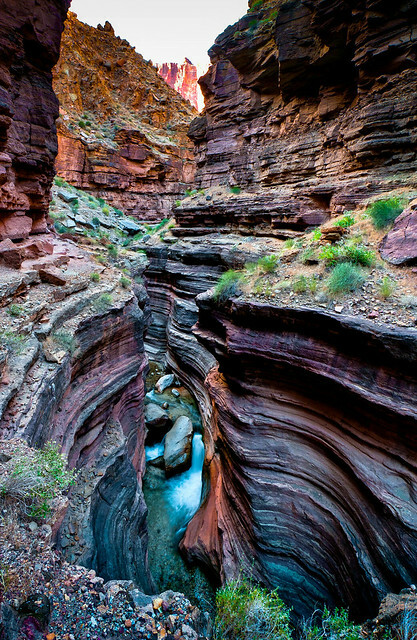 We have recently begun this year's "backpacking season" in Grand Canyon National Park, Arizona. Our plan is to then follow the warm weather north and spend the summer backpacking in Washington State. 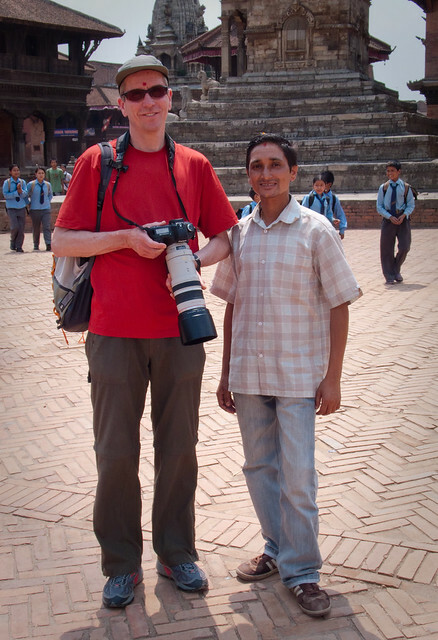 In the meantime, I'm taking this opportunity to write about a "trip of a lifetime" that we took five years ago when we had the supreme privilege to visit Nepal! 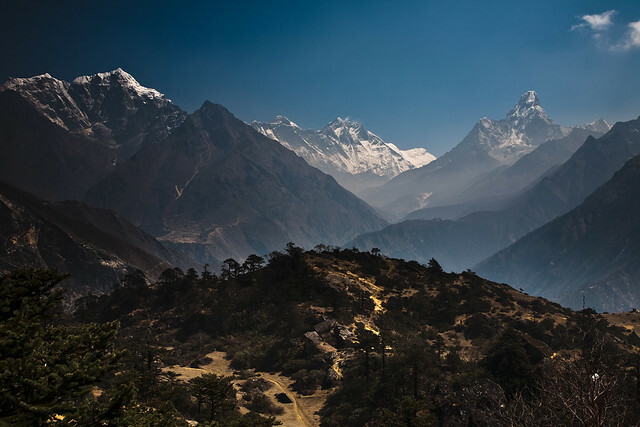 It has been five years since we took the REI Adventures Everest Base Camp Trek up the Khumbu Valley but many of the memories remain fresh in my mind. 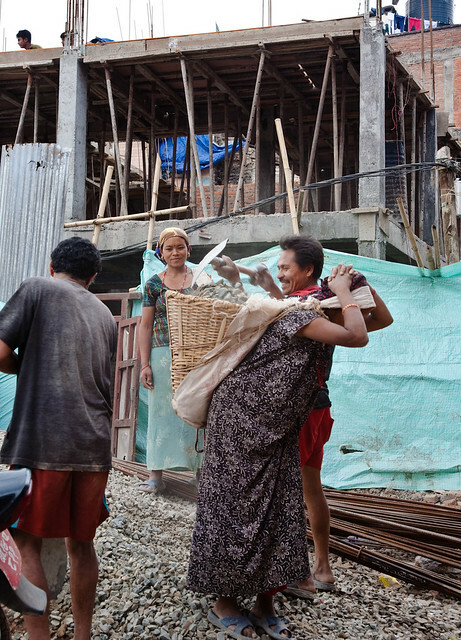 We were so excited to finally be in Nepal after years of desire and months of anticipation. 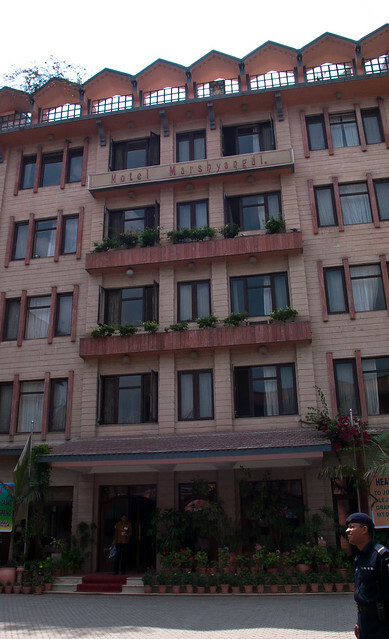 We arrived in Kathmandu late at night and quite tired after spending long hours on the lengthy flights necessary to get there. On the way to our hotel our driver warned us that the city was experiencing rolling “brown outs” due to a chronic shortage of electricity. It was a surreal experience. As we were driven through narrow dark streets we periodically caught glimpses of rubble piles between storefronts and groups of people standing around in the dark. It seemed to be what we could imagine a “war zone” would look like. Once at the hotel we were given a candle and shown to our room. The streets just outside remained noisy and busy all night despite the lack of electric lights but we slept surprisingly well. The next morning we met the nine other individuals who made up our group and we liked them all from the beginning. They were all interesting and wonderfully personable which was great because we would be spending the next two weeks with them under some challenging circumstances. 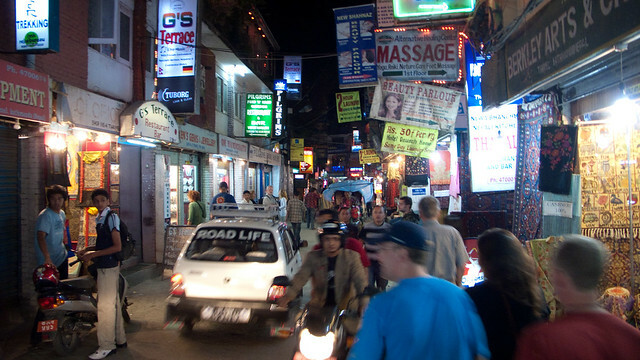 We were then taken on a driving tour around Kathmandu which provided us with our first real views of the city. In daylight we saw that those ruble piles we had seen the previous night were in fact store fronts in the process of being rebuilt and remodeled. 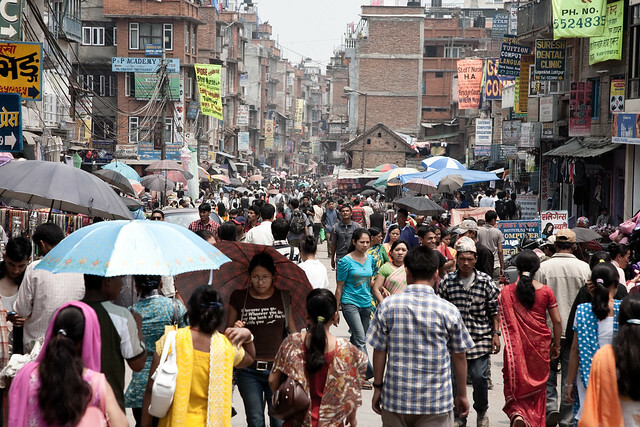 Kathmandu is an intense city. 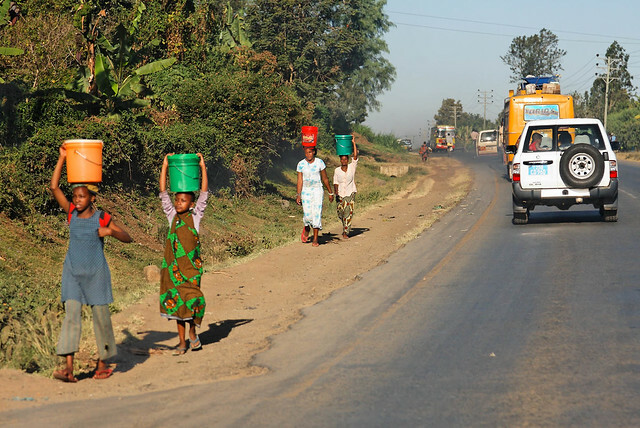 Pedestrians are many and the traffic is quite heavy with drivers using their horns freely, especially the truck drivers. Each elaborately decorated truck seemed to have a unique, and quite musical, horn. 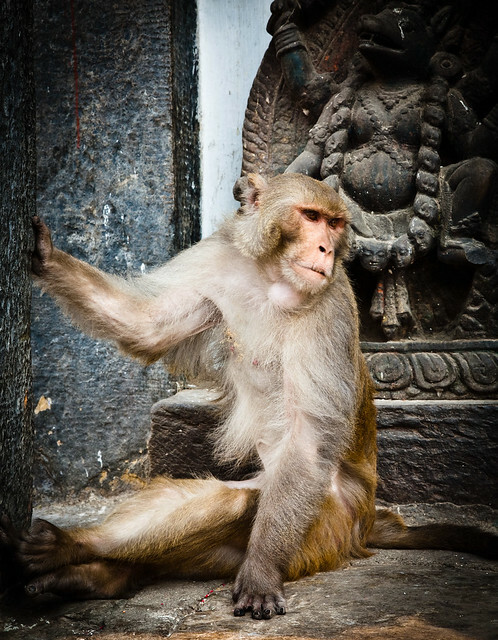 … which is also known as the “Monkey Temple” for some obvious reasons. 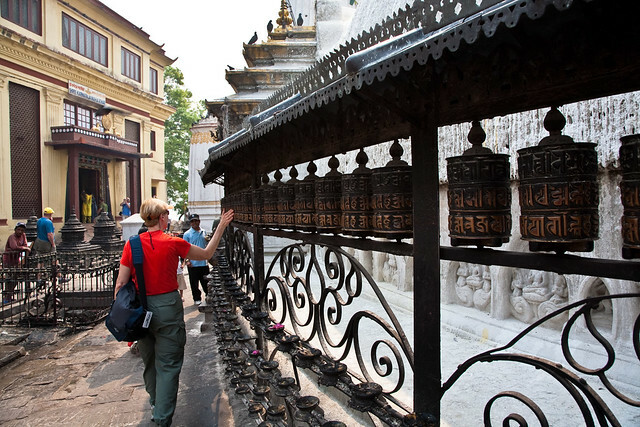 We observed quite a few Buddhists spinning Prayer Wheels (and at least one tourist trying her hand at it). 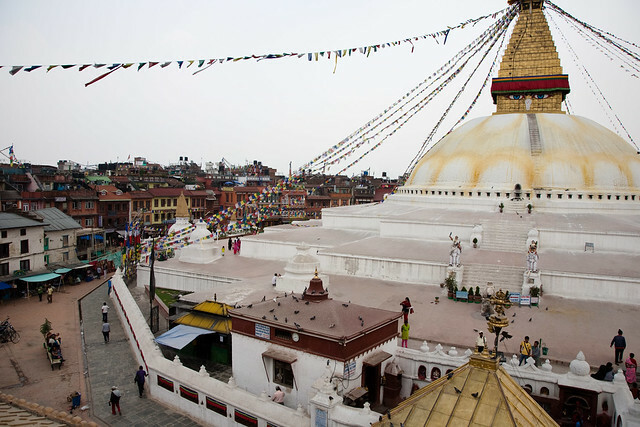 We also saw the impressive Boudhanath Stupa. 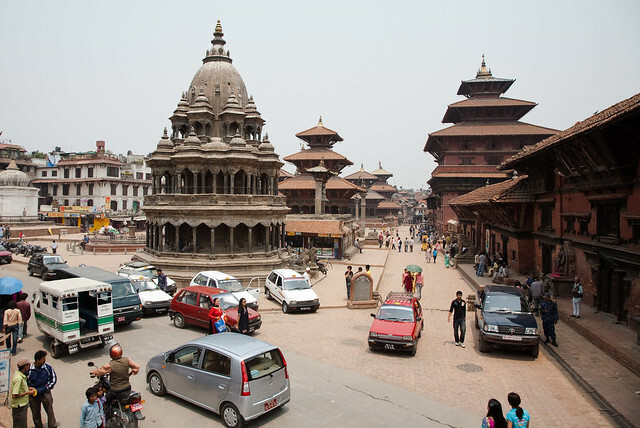 We were later taken to the nearby Patan Durbar Square. 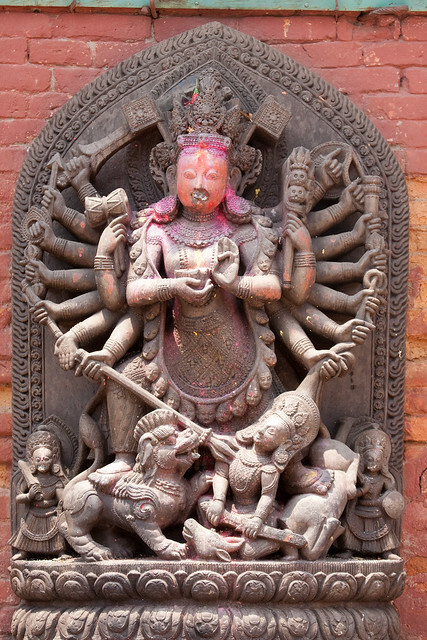 Patan is the oldest city within the Kathmandu Valley and is known as the “City of Fine Arts”. While we were there we were treated to an unexpected performance by these dancers. 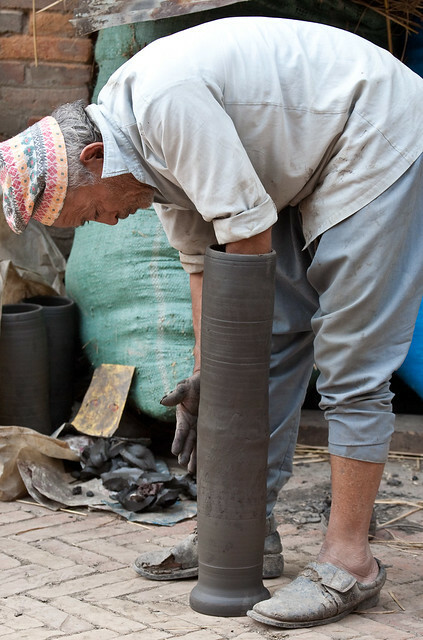 All of our Kathmandu and Patan photos are on Flickr. 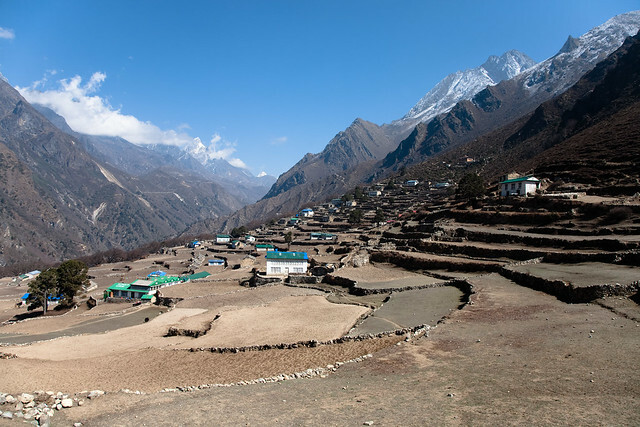 The next day began quite early as we needed to get to the airport to take a short flight to Lukla where our trek up the Khumbu Valley would begin. The airport in Lukla is frequently closed due to adverse weather and low cloud cover, sometimes for days, but we were really lucky to be on the first of the two flights that were able to make the trip that day. 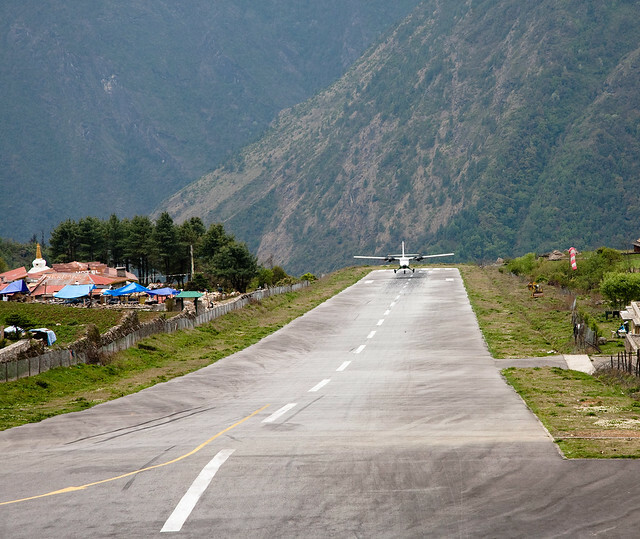 This region has no level ground and Tenzing- Hillary Airport in Lukla has been called the most extreme airport in the world due to the high altitude (9,320 feet), the unpredictable weather and the short sloped runway that has a steep drop off at one end and a mountainside at the other. It reminded me more of a ski jump than a runway. You can get an idea of what this airport is like by watching this video. 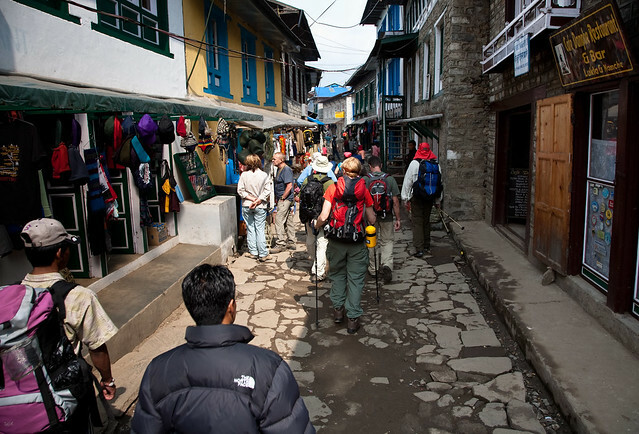 After being served the first of many elaborate lunches we started out on our trek first passing through Lukla. All we had to carry was a daypack with whatever we would need during the day; clothing, water, camera etc. The rest of our gear was in duffels that were loaded on Zopkios. These extremely useful animals are the result of crossing cows with yaks. 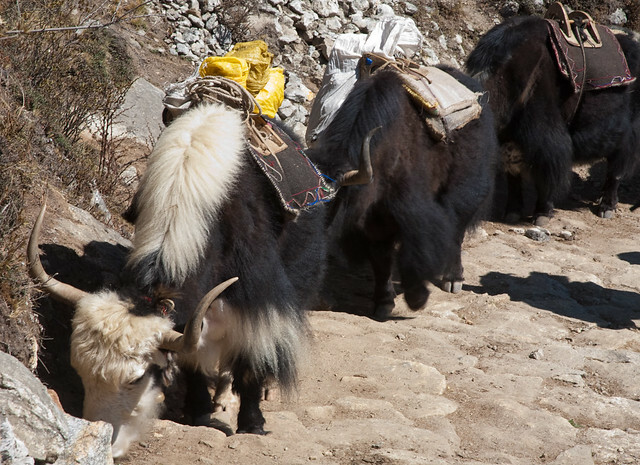 Apparently yaks cannot tolerate the higher temperatures of lower elevations. 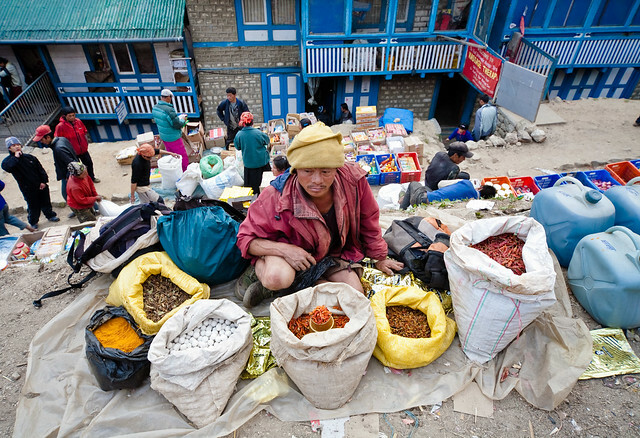 The trail from Lukla to Namche is THE trade route for nearly all of the goods being moved up and down the Khumbu region. The terrain is too steep and rugged for vehicles and flying it in is both expensive and unreliable due to unpredictable weather conditions. 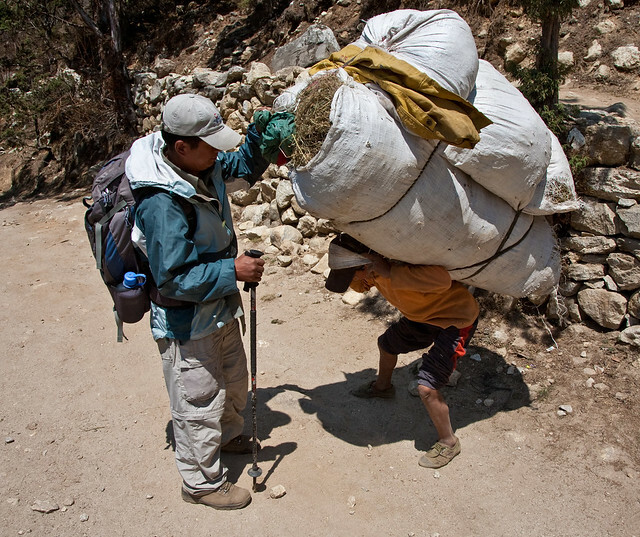 Therefore the vast majority of goods are carried on someone’s back, sometimes animals such as Zopkios, but most often it is carried by some of the hardest working men, women and children on earth. 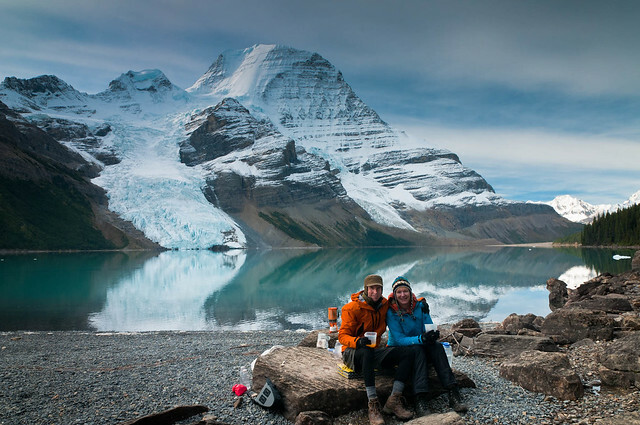 We knew that this trek would not be anything close to what we think of as a “backcountry experience”. This trail is like what US highways were before the interstate highway system was built. 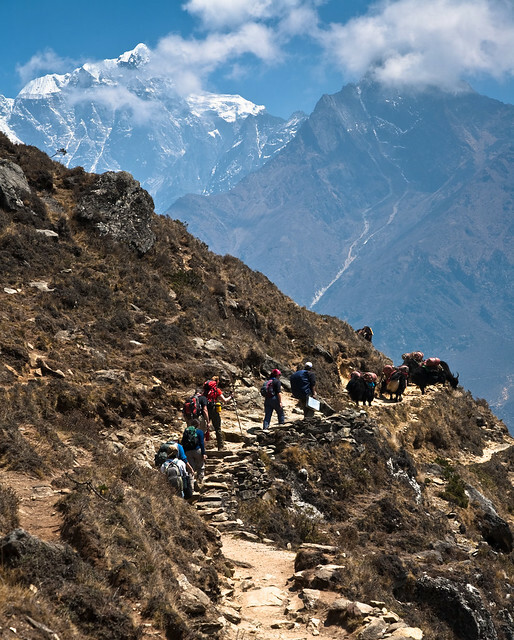 It passes directly through nearly every village located within the Khumbu Valley and in addition to the human “delivery trucks”, every tourist trekker, mountain climber and their porters use this route. 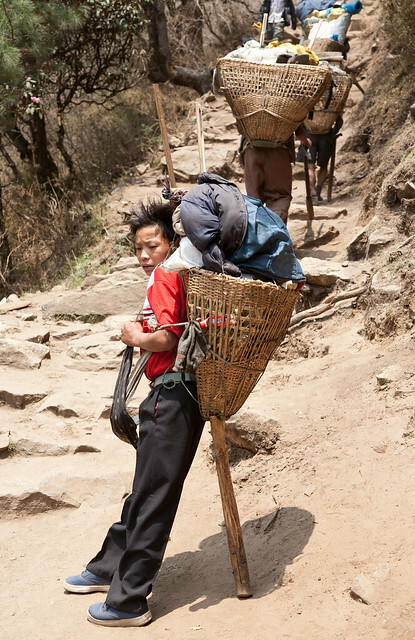 We quickly became aware of a small gesture we could make to lessen our impact on their daily lives, stepping to the side whenever we encountered porters carrying their heavy loads along the trail. 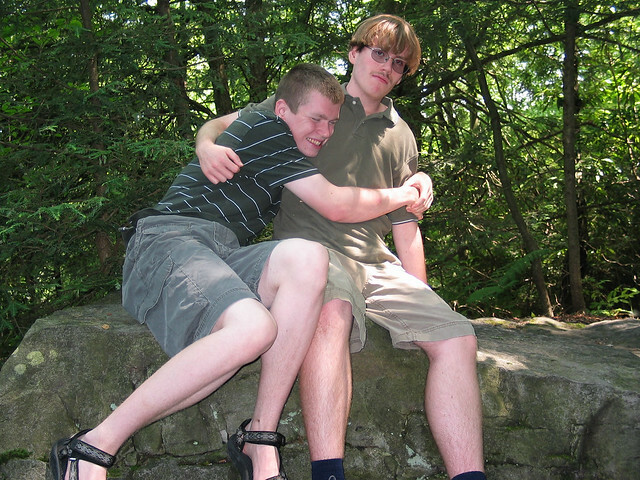 All of the individuals in our group were more than willing to do this. 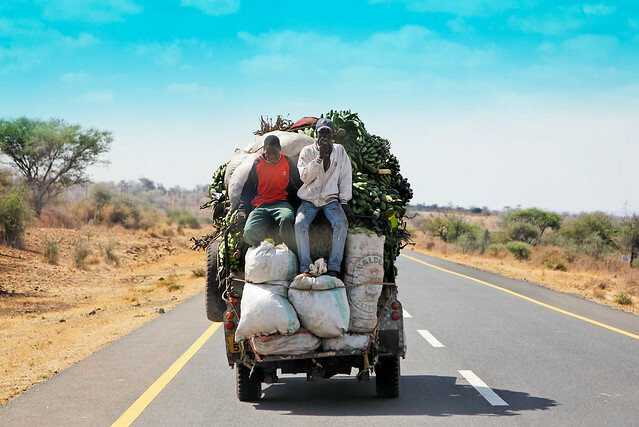 However, we observed that some tourists from more “assertive” cultures were not as accommodating and conspicuously slowed traffic and blocked trails. 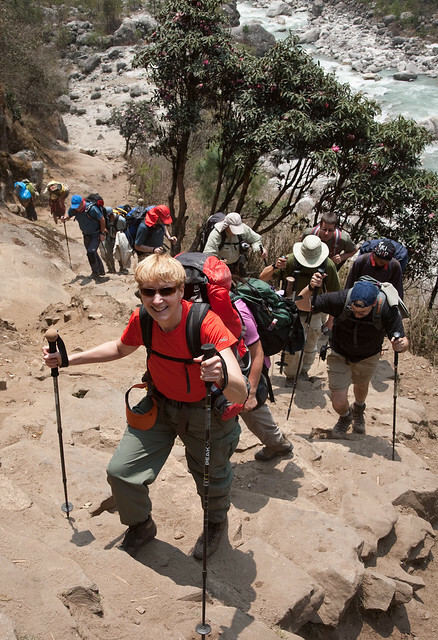 I felt embarrassed by the arrogance exhibited by other white tourists because on several occasions we saw porters “cut switchbacks”, taking an even rougher and steeper route, in order to get around slower moving groups. 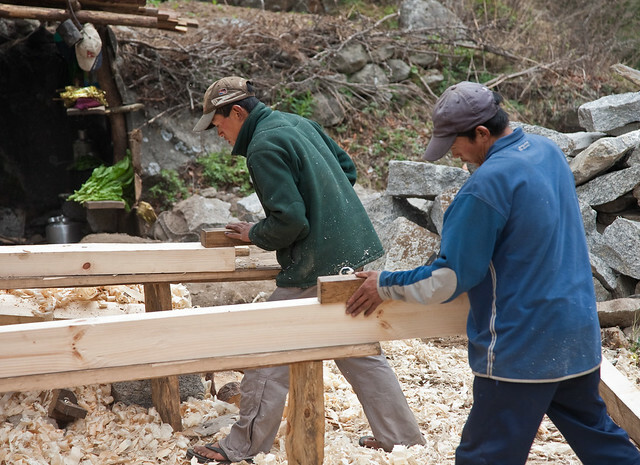 That said, local economies do depend on tourist dollars so these hard working individuals were surprisingly patient and friendly toward us. We did this trek the spring prior to the 2008 Summer Olympics in Beijing and just happened to be there during the time period when the Olympic Torch was being carried up Mt Everest on the Tibet side. 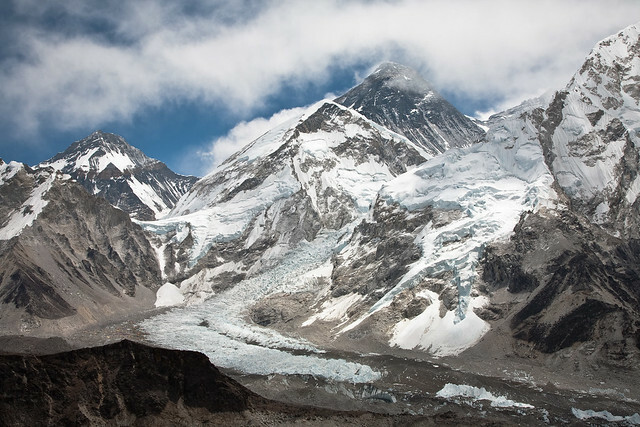 In an effort to prevent any “Free Tibet” activity all routes up Mt Everest on the Nepal side were closed beyond Everest Base Camp per a “request” made by the Chinese government. Nepal, we were told, is well aware of its position as a small country located between two much larger ones. 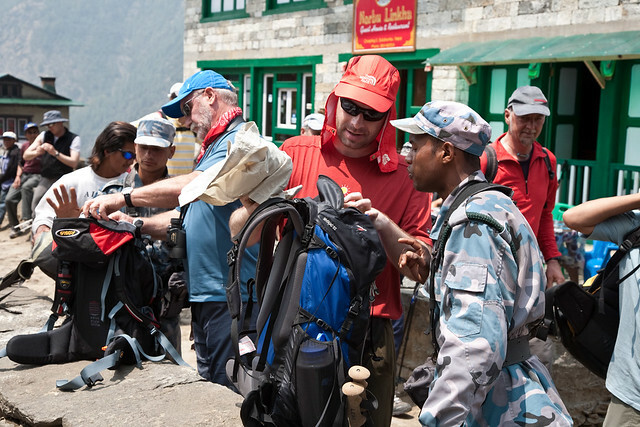 Therefore, armed guards searched all trekker’s daypacks at two separate locations. Hopefully this satisfied the Chinese government. However, it would not have been enough to prevent any of us from bringing in any forbidden paraphernalia as none of the duffels containing most of our gear that were strapped to the backs of Zopkios were searched. 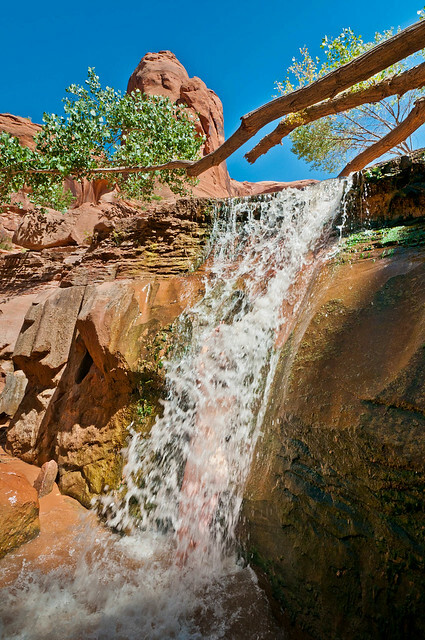 … and the trail crosses back and forth over the river multiple times. 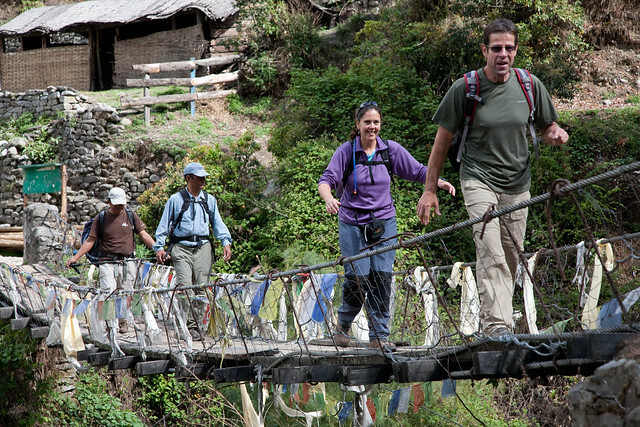 We were extremely grateful for the great number of substantial suspension bridges. We were told had been built by the “Swiss” and I’m assuming this means Swiss mountain climbing teams. I don't want to sound ungrateful but I wouldn't have minded if they had replaced just one more. 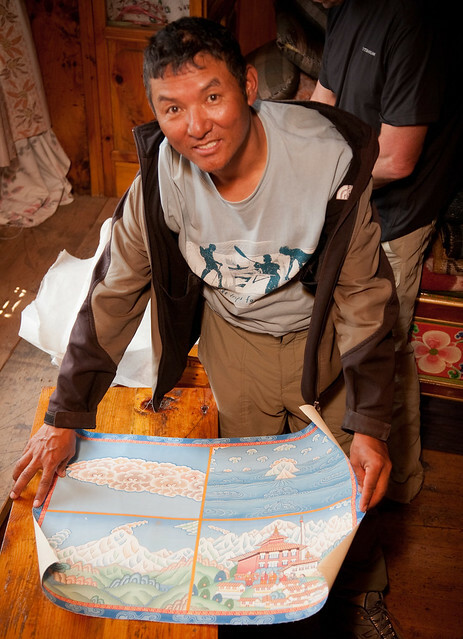 We received an extremely pleasant surprise when our guide stopped to introduce us to this fellow, Apa Sherpa, the man who holds the record for the most successful climbs of Mt Everest. At that point in time he was on his way for number 18 but has since broken his own record which, as of 2011, stands at 21. 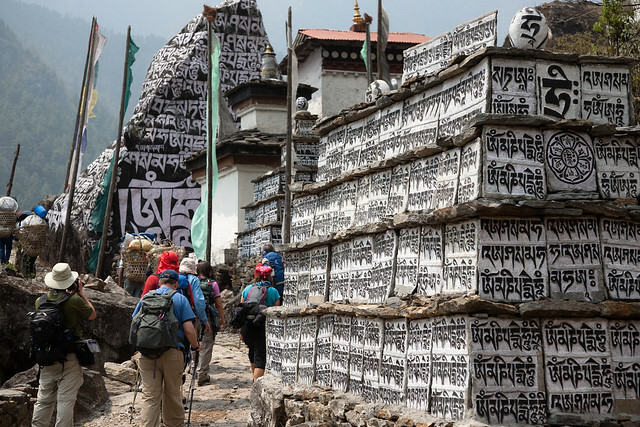 Throughout the trek we would pass countless "Mani (prayer) Stones" and we were told that the proper way to pass them was by going around them in a clockwise fashion. 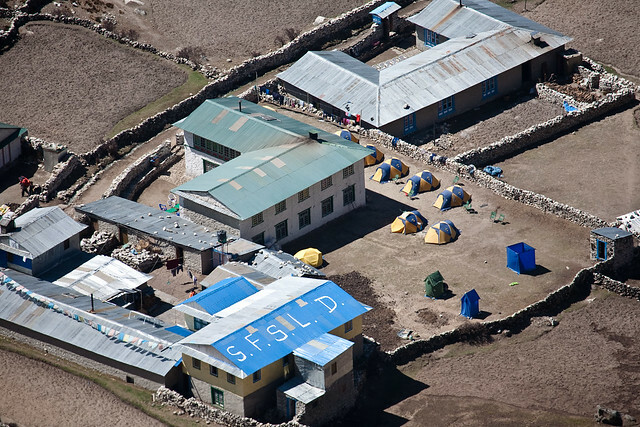 We actually lost elevation that first day going from Lukla at 9,320 feet to our first camp in Phakding at 8,560 feet. 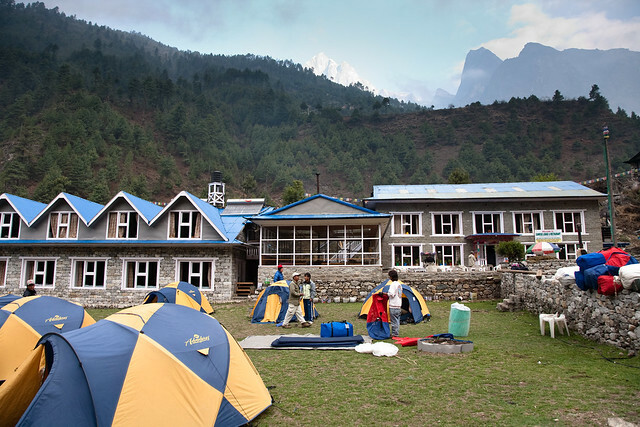 We would be staying in spacious tents for the entire trek but our camp would often be set up adjacent to a tea house. 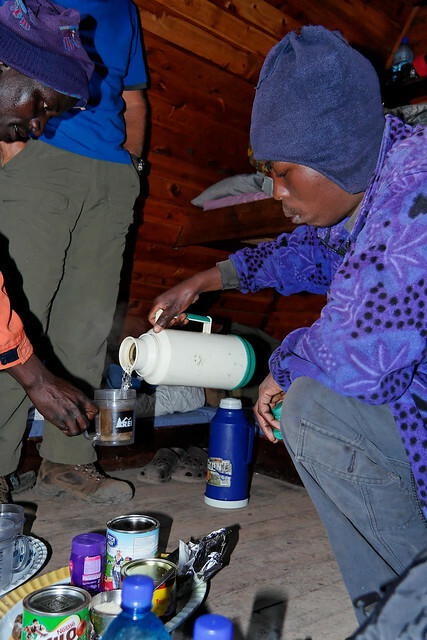 We were then introduced to the luxuries we could expect to magically appear at our tent twice a day; hot tea and a basin of hot water to wash in. 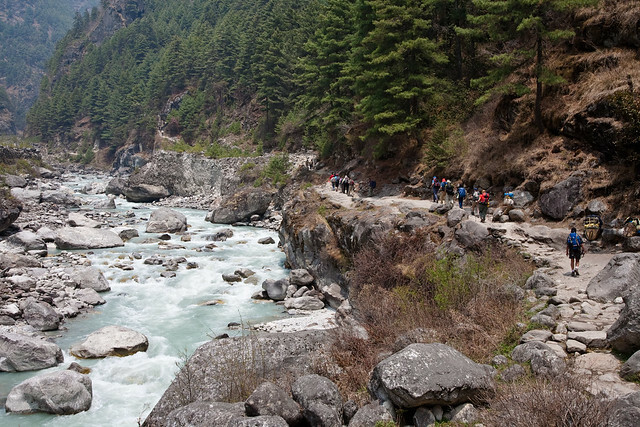 On the second day of our trek I experienced intense mixed emotions. 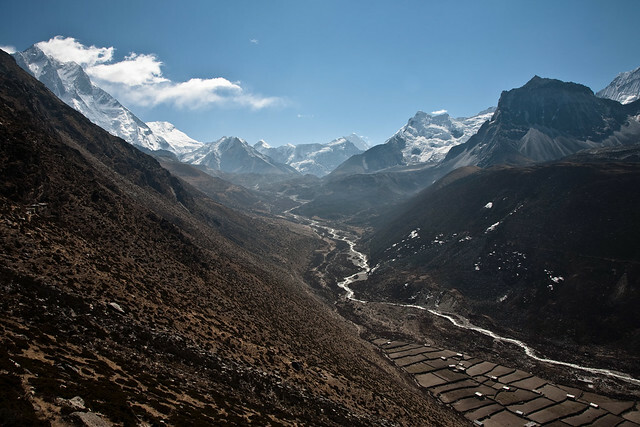 I had so wanted to see the Khumbu Valley and the Himalayan Mountains. However, I couldn’t help but notice the negative impact that our presence had on the lives of people who live and work along the route. They were obviously burned out with tourists; we clog the trail, take their picture without asking and give candy to their children. Perhaps the worst offense is that we assume we have a right to use privately owned toilets which were never designed to handle the hundreds of people who use them. 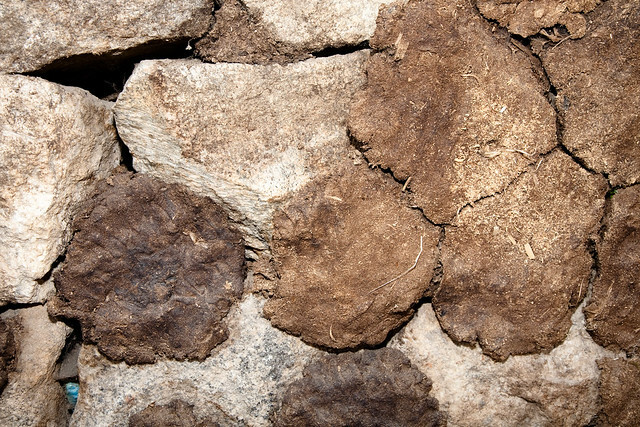 Generally speaking, these toilets are located within small wooden or stone buildings, built on either a slope or on stilts, with a hole cut in the floor with a pile of vegetative materials; leaves, needles etc, heaped on the ground below. 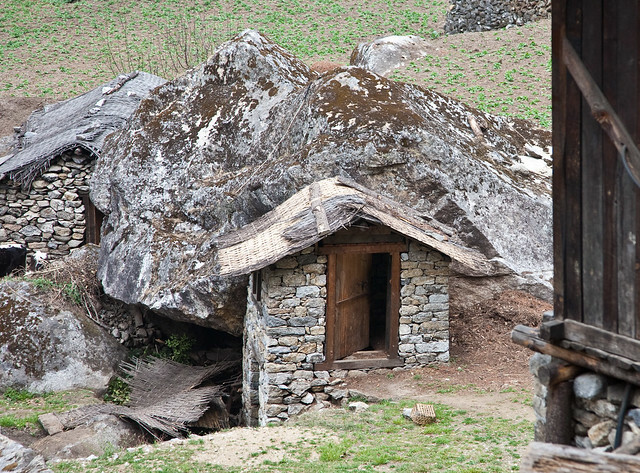 These structures are typically located not far uphill from the Dudh Koshi River which supplies water to countless people living downstream. If we needed to use their facilities we were encouraged to purchase something from their shop. The modest price of a coke, a Mars Bar, or some Pringles seemed like an extremely small price to pay. But unfortunately, many tourists were unwilling to do even that. 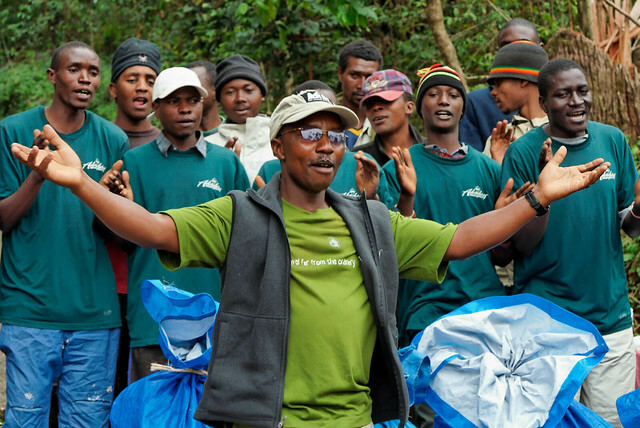 I would love to see a cooperative effort by all tourists and climbers to fund the construction and maintenance of environmentally safe composting toilets. Personally, I would have been happy to pay an equitable fee to use them as one can eat just so many Pringles. 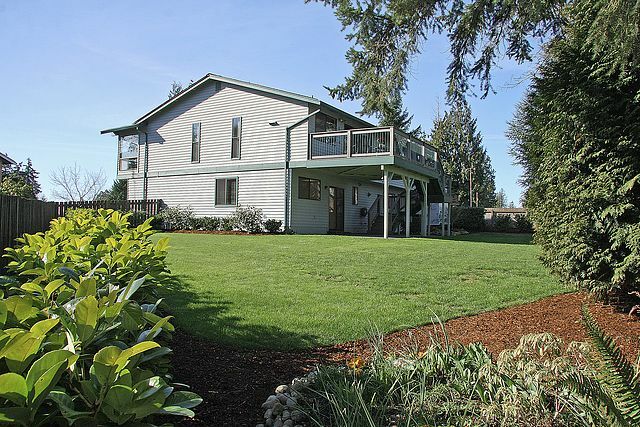 … past lush fields (it was suggested that we enjoy the sight of green while we could). 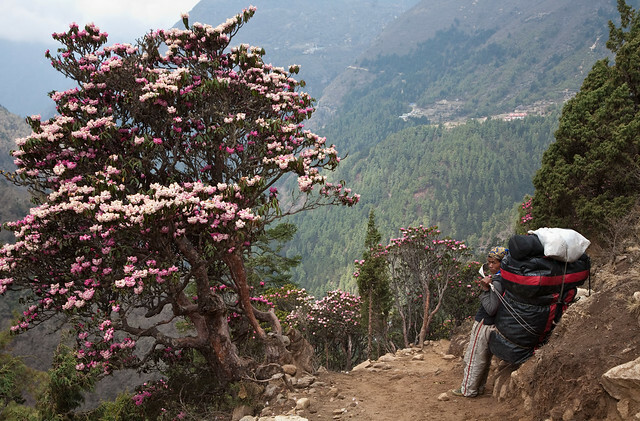 We had been warned that the final approach to our destination for the day would be challenging as we needed to gain 2,000 feet over a mile and a half at increasing altitude in order to reach Namche Bazaar, situated at 11,285 feet. 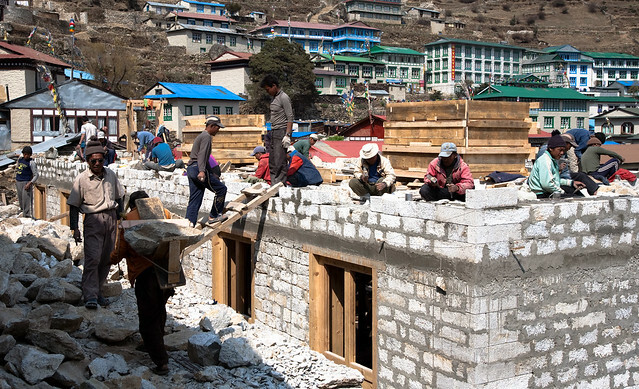 We were all relieved to finally see the official entrance to Namche Bazaar which is the largest Sherpa village and it is an amazing sight to see how they have manged to build such an impressive settlement in an area with no flat land. 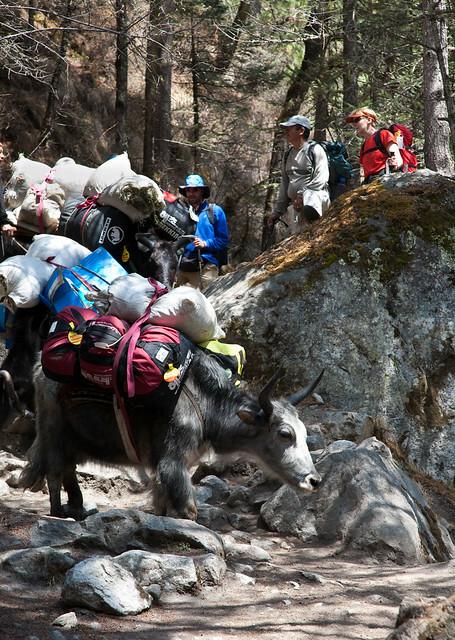 The word "sherpa" is commonly used incorrectly to describe the people who carry gear for mountain climbers. The correct term for those who do that job is "porter". 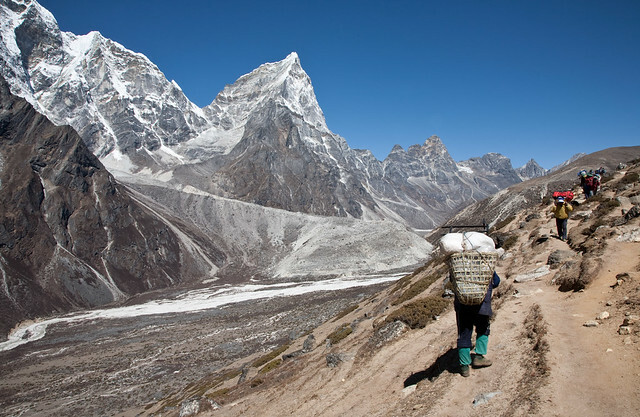 "Sherpa" refers to the ethnic group of people who inhabit the Khumbu Region. It is also their last name. 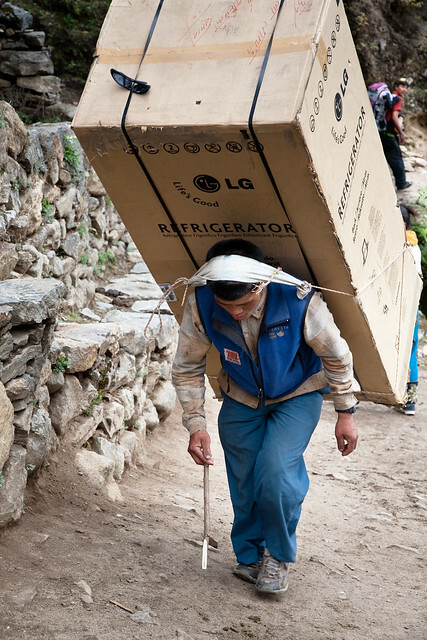 While most porters are Sherpa, not all Sherpa are porters. 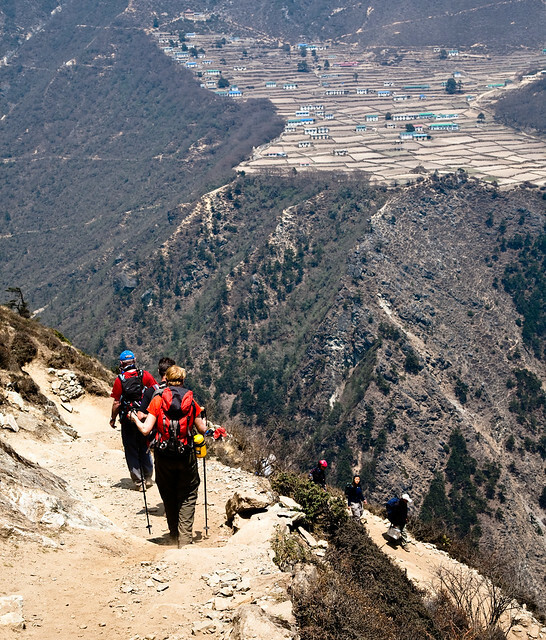 Every trekking group passes through Namche's narrow streets. 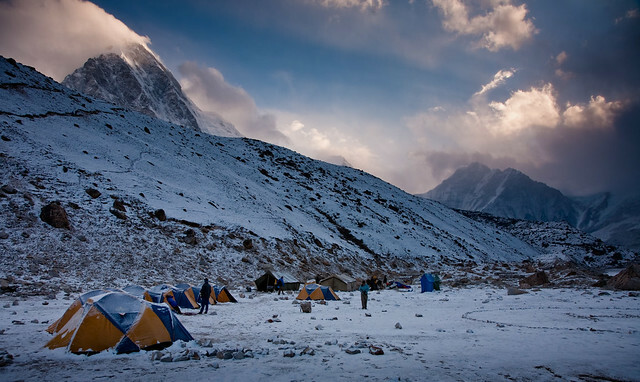 In addition, it is the primary staging area for all Everest expeditions from the Nepal side. 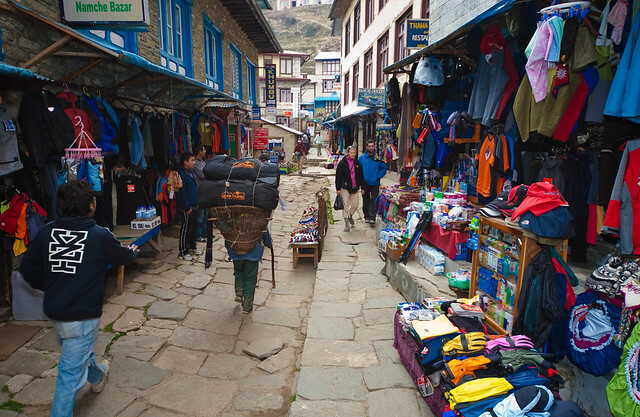 The crowded streets are lined with shops selling "name brand" outdoor gear at amazingly low prices. However, closer inspection revealed that many articles for sale were actually cheaper “knock offs” made in other countries. Once again our tents were set up adjacent to a tea house. 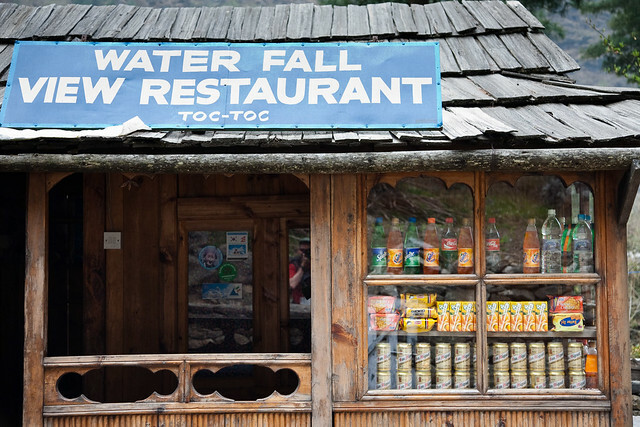 Whenever we camped near a tea house we were served our meals in comfortable dining rooms. Like I said, it is not a backcountry experience. 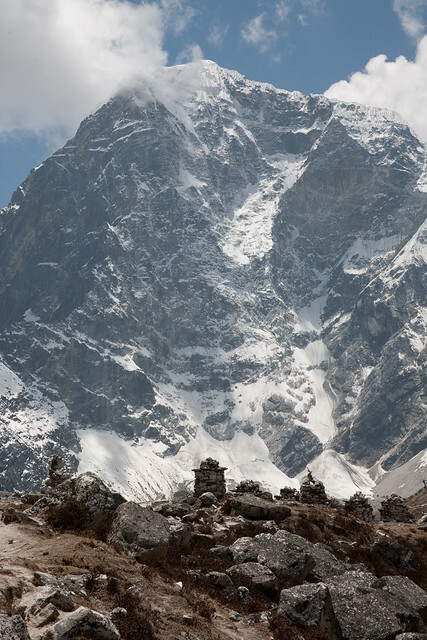 … as far as the Everest View Hotel gaining 1,250 feet. This provided us with our first views of prominent mountains including Taboche (20,890 feet), Lhotse (27,605 feet) and Ama Dablam (22,493 feet) as well as the very tippy top of Mount Everest (29,035 feet) just visible in the very far distance. 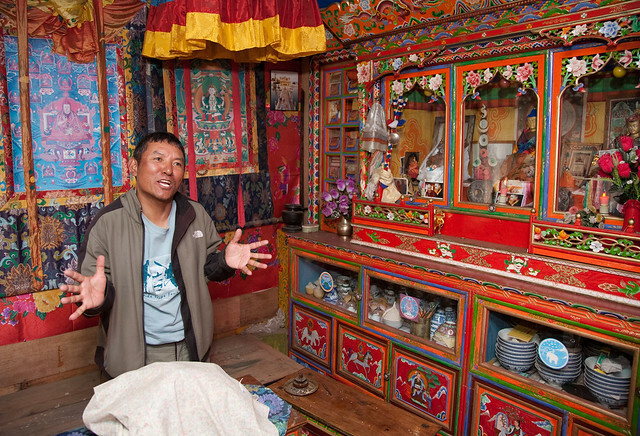 Once back in Namche Bazaar we had the opportunity to see the beautifully decorated home of our guide. Thupten is a former Buddhist Monk who left the monastery in order to care for his mother after the death of his father. We left Namche Bazaar the following morning and looking back provided a view of Nupla and the three summits of Kongde Ri; Shar, Lho and Nup, in the distance. At these higher elevations we saw our first Yaks. 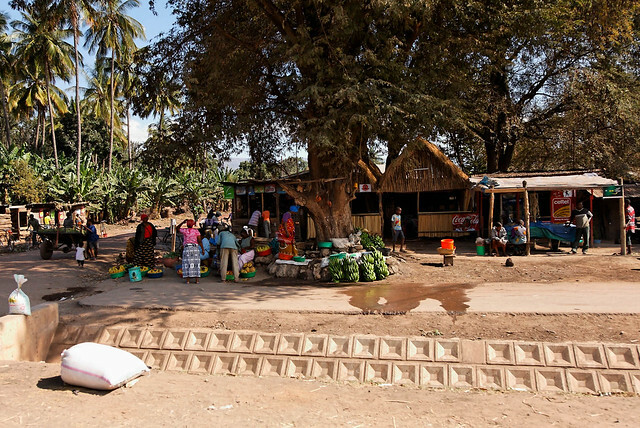 The trail continued to pass through villages with opportunities to rest and spend money. 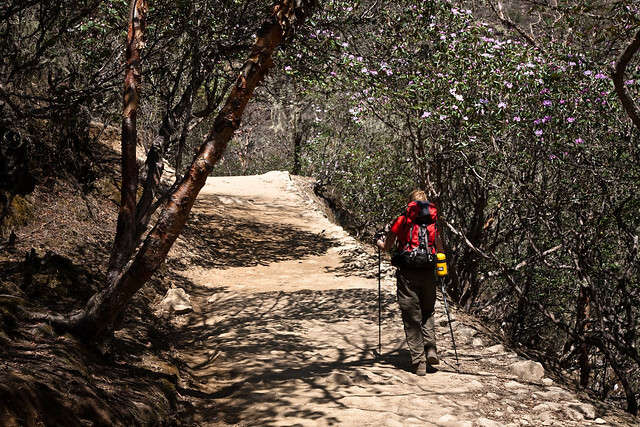 We temporarily left the standard trail, taking instead one that passed through a lovely Rhododendron forest. 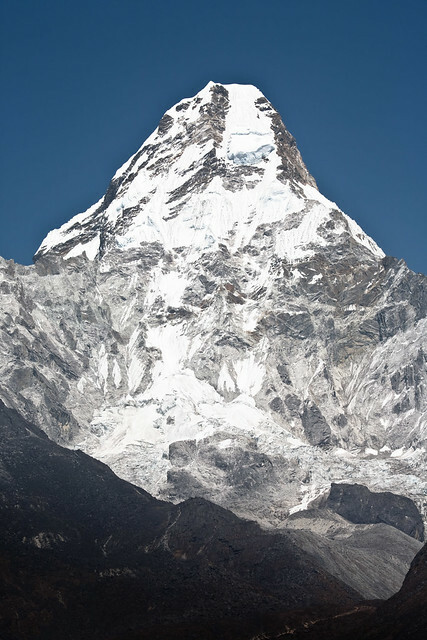 … and Ama Dablam (22,493 feet). The trail then descended toward the Dudh Koshi River near the remote village of Phortse Tenga where we would camp for the night (12,100 feet). On the way down the trail we got a view of the terraced fields of Phortse, a village on the other side of the valley that we would pass through on the following day. This camp was not set up adjacent to a tea house so our morning and evening meals were prepared, as well as served, in large tents. 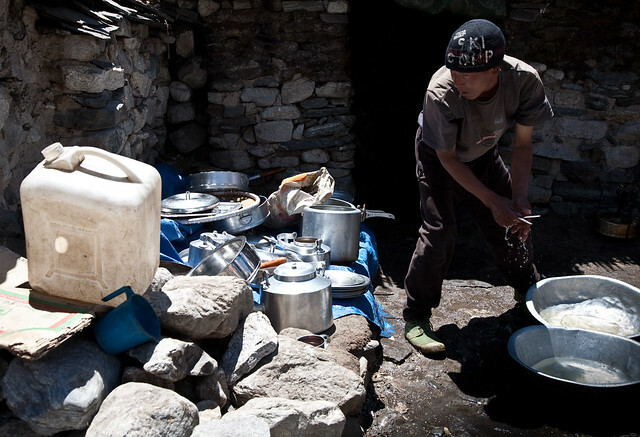 Our cooks worked miracles producing a wide variety of dishes using only pots on kerosene stoves. That day happened to be my birthday and I was greatly surprised to be presented with a delicious birthday cake, complete with frosting. 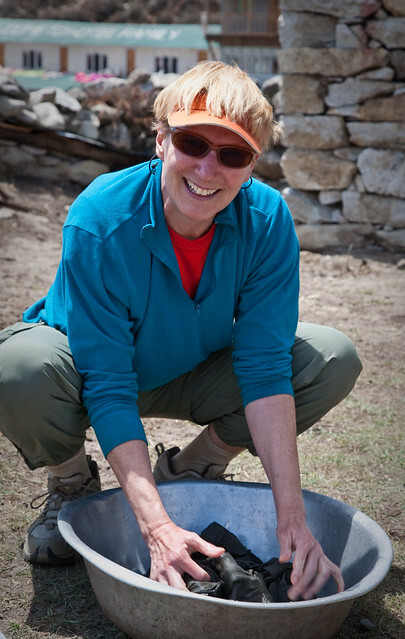 I had trouble figuring out how one can bake a cake in the heart of the Himalayas with nothing but a kerosene stove but it apparently involves a large pan filled with hot rocks. Amazing! 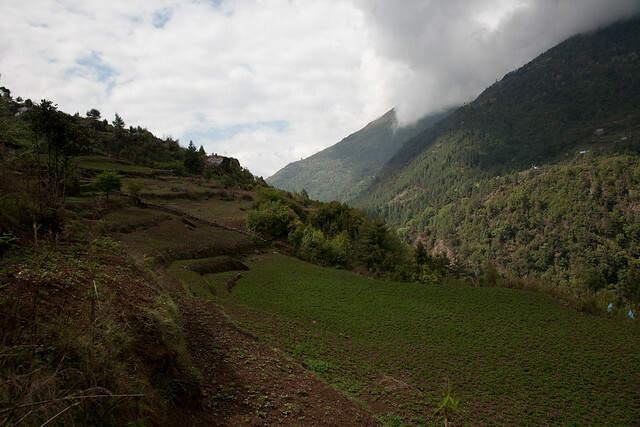 ... and I was especially impressed by the sight of the terraced land that has been laboriously constructed by farmers in this mountainous region. 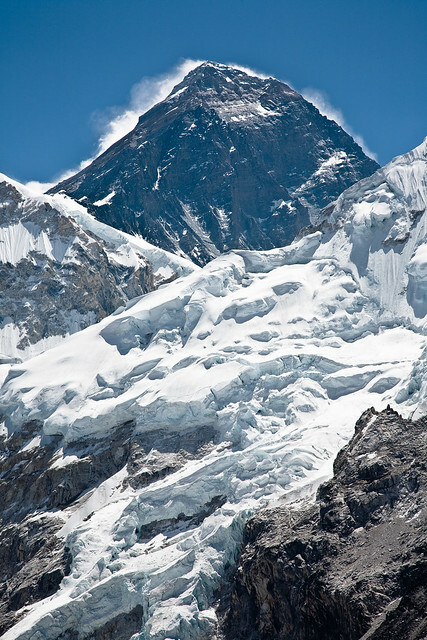 ... and Kantega (22,254 feet) which boasts an intricate summit. 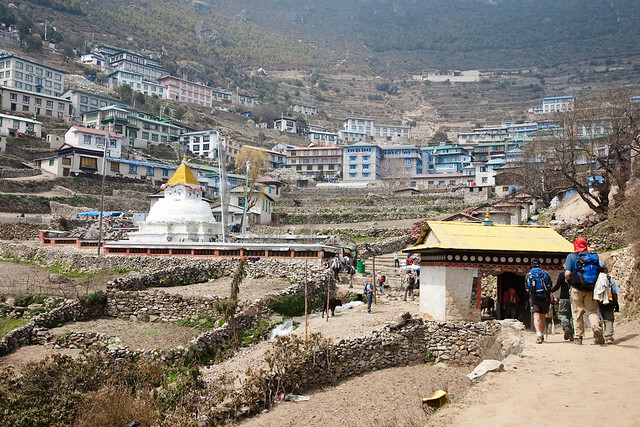 Our short trekking day enabled us to visit the nearby Pangboche Monastery. The next morning we continued to hike higher, this time along the Imja Khola River, passing through more, but smaller, villages. 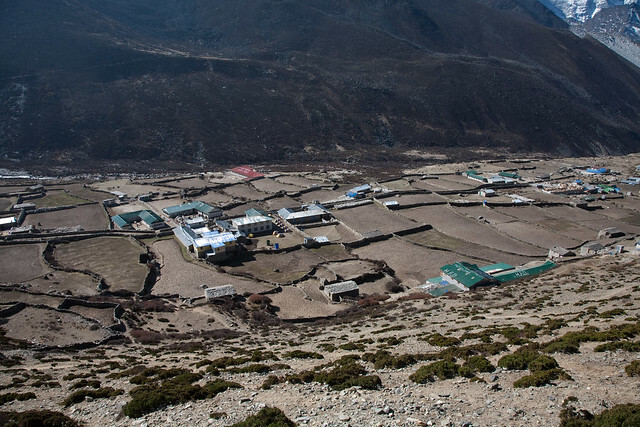 Our destination for the day was Dingboche (14,550 feet), the highest permanent Sherpa village in the Khumbu Region. We had a lovely view of Taboche (20,890 feet). 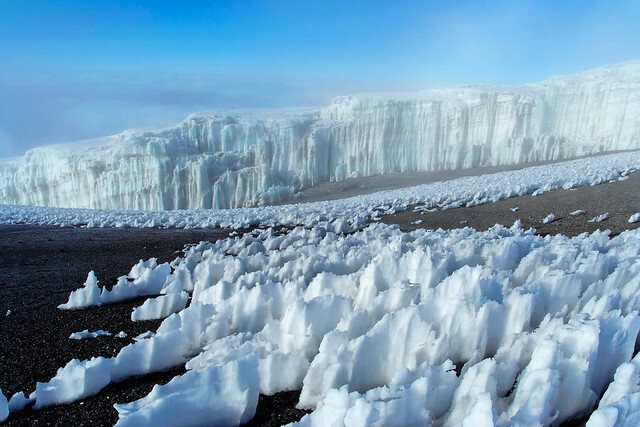 We had become accustomed to seeing Gompas but I marveled at how they have survived the harsh climate and I found myself wondering who built them and when they were built. 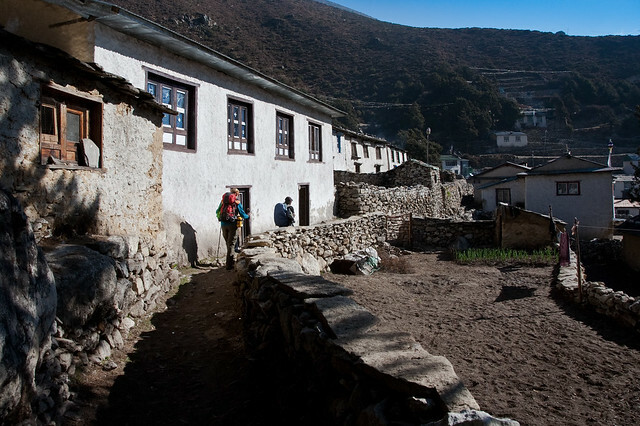 We spent two nights in Dingboche in order to do another acclimatization day hike before ascending further. 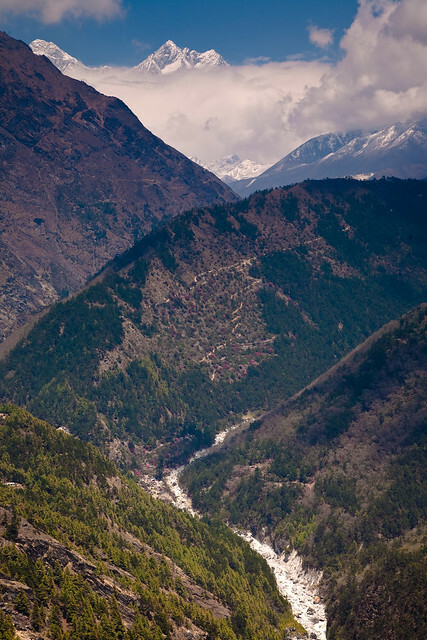 This enabled us to get a view up the Imja Khola River valley to distant mountains we would otherwise not get to see. As we descended from our dayhike we welcomed the sight of the blue shower tent (visible in the lower right hand corner of photo below). We had been trekking for a week and a shower would be a real treat. The small blue and green tents to the left of the shower tent are toilet tents (also known as "Happy Tents"). We were provided with these much appreciated facilities, consisting of comfortable seats situated over holes dug in the ground, at nearly every place we camped (with the one exception of Phakding). 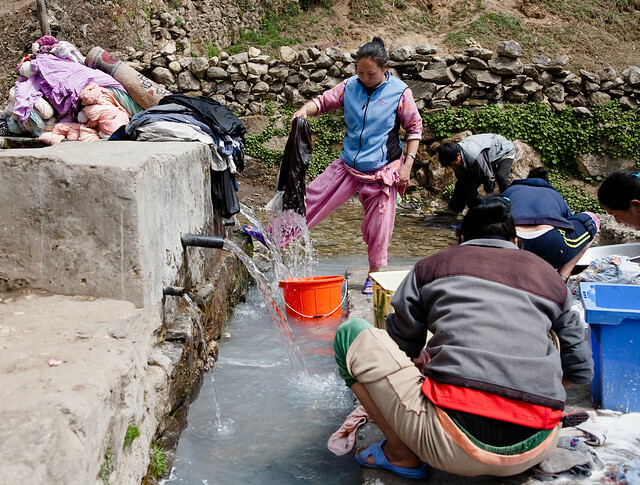 While in Dingboche we also had the opportunity to do a bit of laundry. 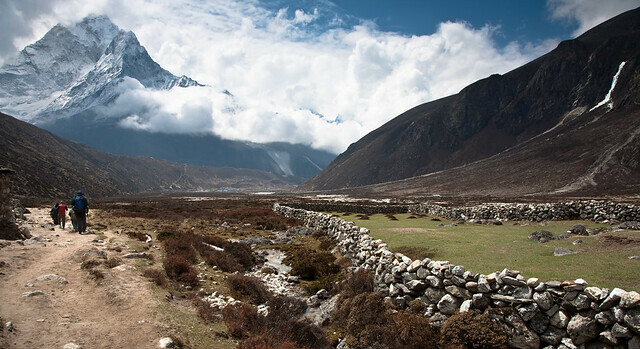 When we left Dingboche we traversed the Pheriche Valley before ascending to Thokla Pass past the "toe" of the Khumbu glacier. Looking back we had the opportunity to see familiar peaks but now from different angles. 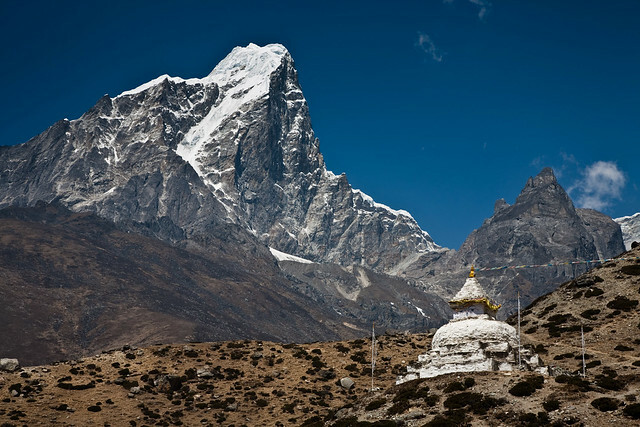 We could now see Ama Dablam's "neighbor", Amphu Gyabjen (18,471 feet), which had previously been obscured. When hiking in such huge mountains it is difficult to feel like you are making any forward progress but this really helped give us a sense of how far we had actually come. 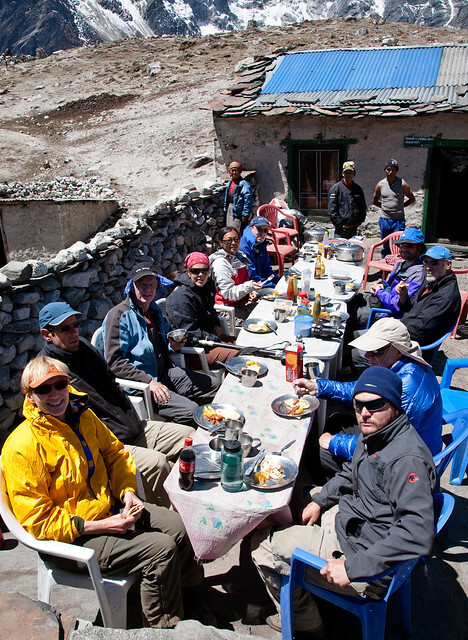 It was common for us to be served an elaborate hot lunch every day on the trek. 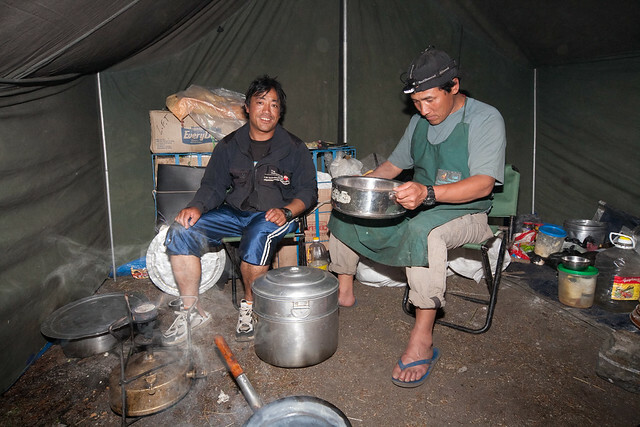 Each morning, while some of the cooks and porters prepared and served us our breakfast, other cooks and porters would leave our camp before daybreak in order to have our hot lunch ready for us when we arrived. It never ceased to amaze me how high the level of service was that these hardworking fellows provided us in such remote locations. 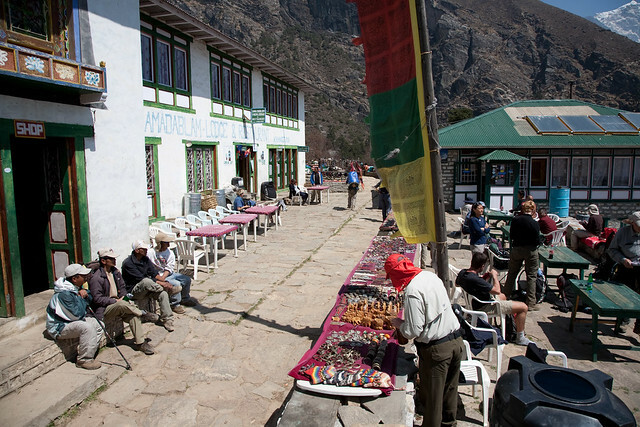 Our destination for the day was the trekker's outpost of Lobuche (16,110 feet). 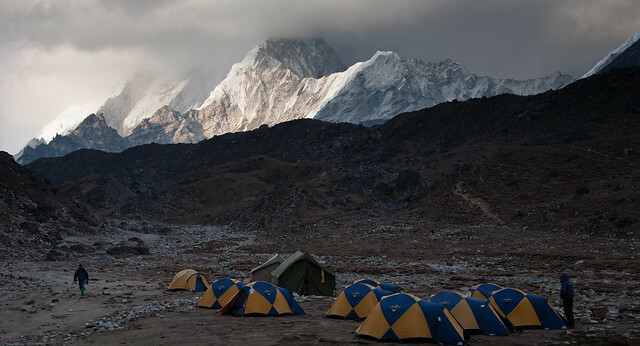 Our camp was set up below the impressive peak, Lobuche (20,075 feet). The weather was beginning to deteriorate. 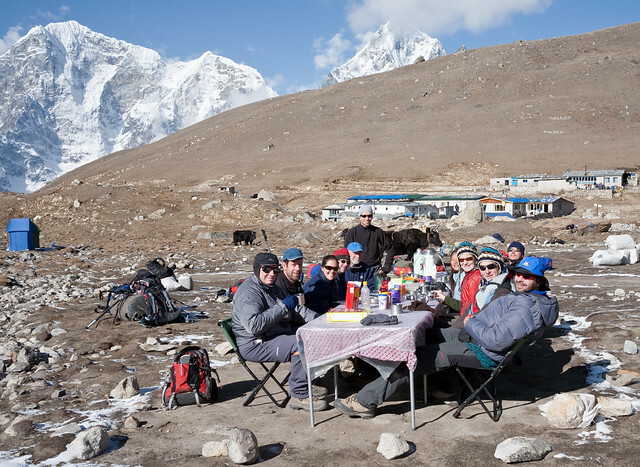 The following day we would be trekking to our highest camp at Gorek Shep where we had the option of doing two different day trips; one to Everest Base Camp and one to the top of Kala Pattar for the best view of Mt Everest. The decision was made to leave our camp at Lobuche quite early in the morning and try to get to the top of Kala Pattar before the clouds moved in. 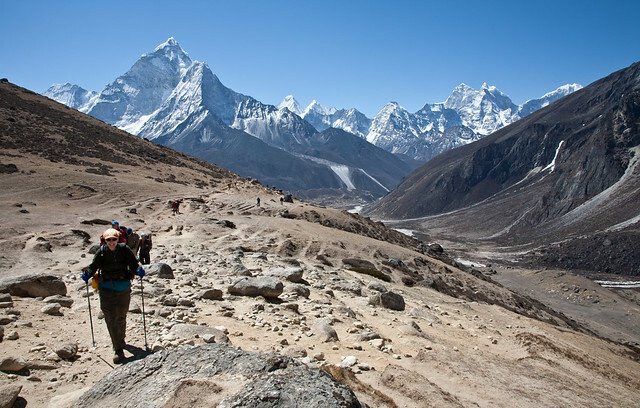 The hike to Everest Base Camp could be done the following day, weather permitting. So, we all got up early and hit the trail. 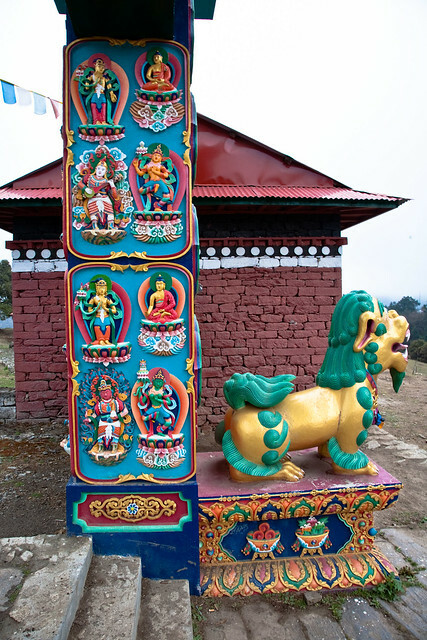 On the way we were confronted with some sobering reminders of the dangers involved in climbing the world's highest mountain, countless "chortens" built in honor of dead climbers. 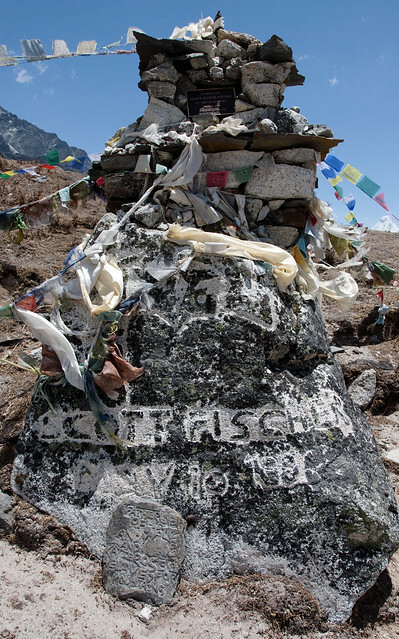 One chorten stood out in particular, that of Scott Fischer, who was one of the nine climbers who died in what is called the "1996 Mount Everest Disaster". It got me thinking about another climber who died that day, Doug Hansen. He had worked in our local post office and our son's elementary school had done a fund raiser to help finance this climb. I proudly wore my "Doug Hansen supporter" tee shirt! I was helping out at school the morning the principal received a call from Doug (via satellite phone) while he stood on the summit. We were all so happy for him! However, a few hours later we heard the tragic news that Doug was one of nine climbers who had died. While John never had any interest in being such an elite mountain climber in his "climbing days" he was certainly in situations that could have gone badly. 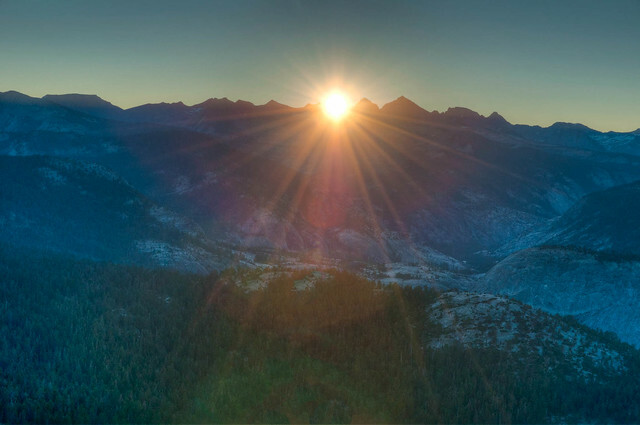 Late at night when I waited for him to come home I consoled myself with the belief that if it was his time to die then I would rather it be on a mountain he loved than squished in the car on I-405 while driving home from work. 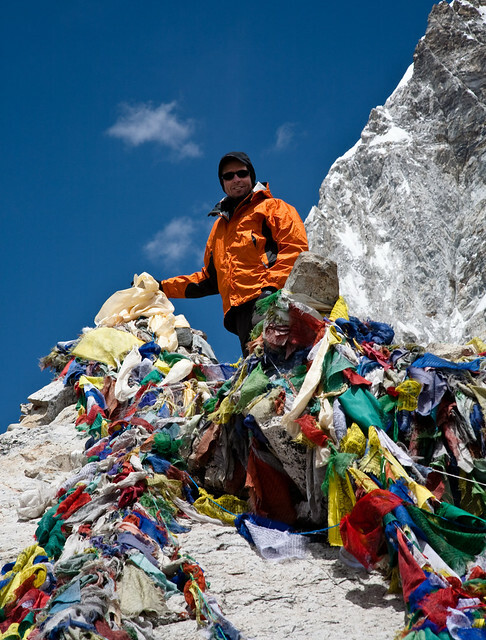 I find some solace in the fact that Doug Hansen achieved his greatest dream, reaching the summit of Mt Everest. 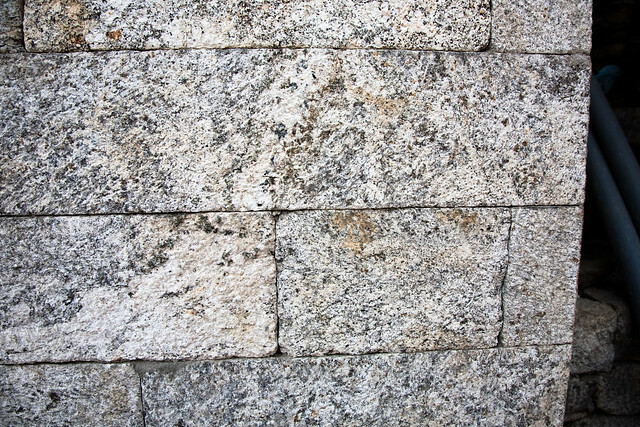 But he had to break the climber's "Golden Rule" - "Don't let desire overcome judgement" - in order to do it. 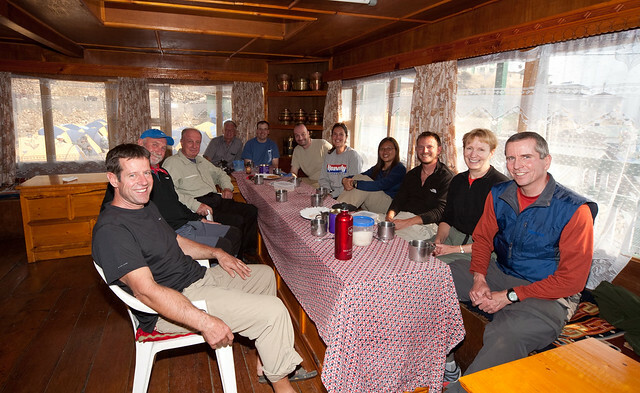 We continued on to our highest camp at Gorek Shep (16,865 feet). The highest point of the trek was the summit of Kala Pattar (18,510 feet), the unimpressive looking brown mound to the left. While John made it to the top without a problem I was very disappointed to not able to go as I was experiencing some altitude related health issues. 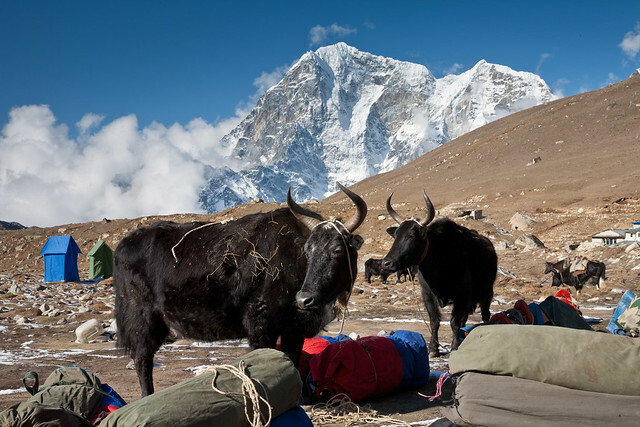 Being on Kala Pattar provides the best views of the top of the Khumbu Valley and the surrounding mountains including Changtse (24,747 feet), Lho La (19,770 feet), Mt Everest (29,029 feet) and Lhotse (27,940 feet). Of course, Mt Everest is considered the "star of the show" but it was surprising to see so much bare rock rather than a snow covered peak. Global climate change appears to be the culprit which is unfortunate. 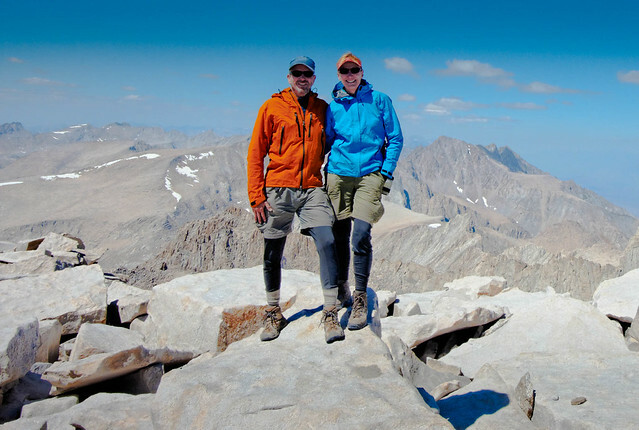 Less snow and more loose rock makes it more dangerous for climbers and there is concern that it may become too treacherous to climb in the not too distant future. 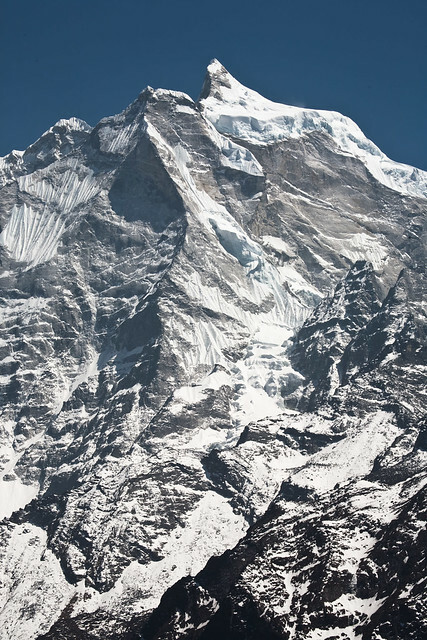 However, just because Mt Everest is the highest mountain in the world doesn't mean that her nearby "little sisters" are not worthy of attention. 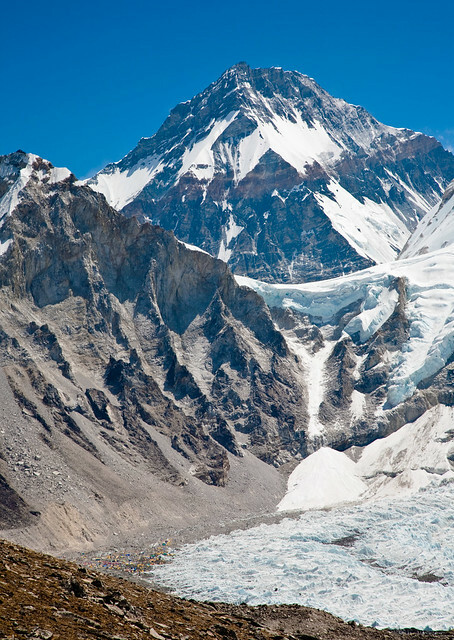 I personally found Nuptse (25,791 feet) to be far more attractive than Everest. 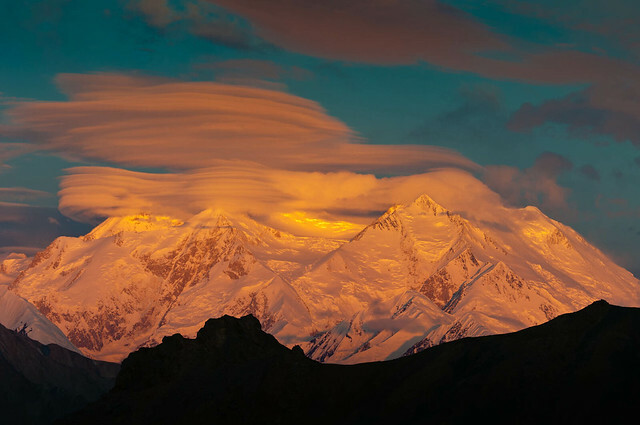 In addition, I also think Changtse (24,747 feet) is under appreciated. How many non climbers have heard of any of the mountains in the photos within this post other than Mt Everest? I'm ashamed to admit that prior to our planning this trip that my answer was none. If you look closely you can just barely see Everest Base Camp in the lower left hand corner of the photo below. 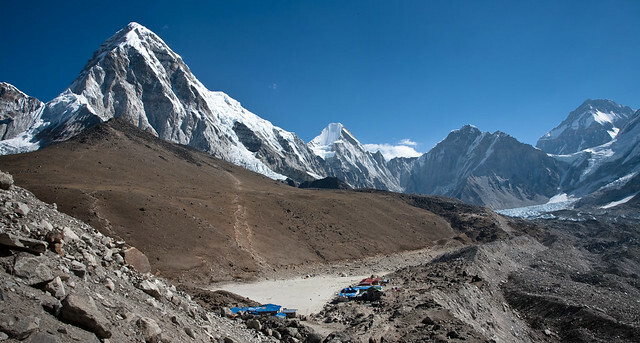 Changtse (24,747 feet) with Everest Base Camp just barely visible in lower left. That night was the coldest we had experienced with temperatures within our tents getting down to about 20 degrees. 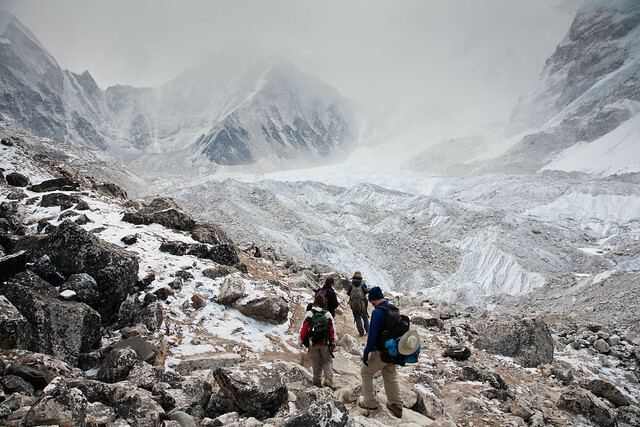 The weather remained unsettled and decisions needed to be made by all; either hike to Everest Base Camp or descend directly back to Lobuche, our next camp. The four youngest members of our group plus John decided to make the the trip to base camp while the rest of us descended. Once again I was disappointed to not have made the most of this rare opportunity but one just doesn't mess around with altitude sickness. 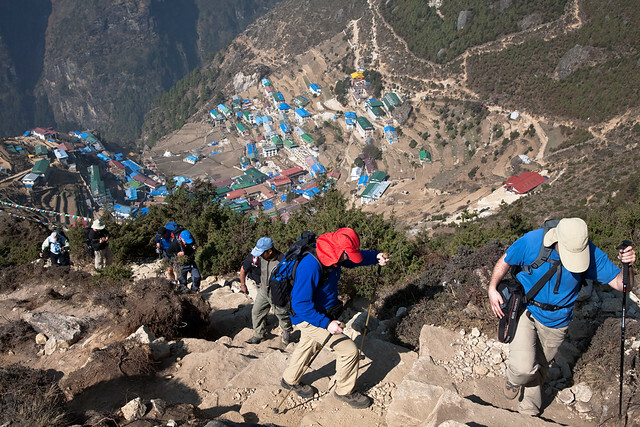 The route to Everest Base Camp was rough and rugged and unfortunately the weather had continued to deteriorate. 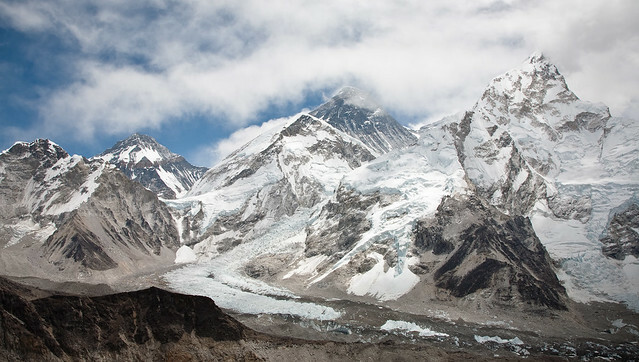 Once they finally reached Everest Base Camp the weather was abysmal. 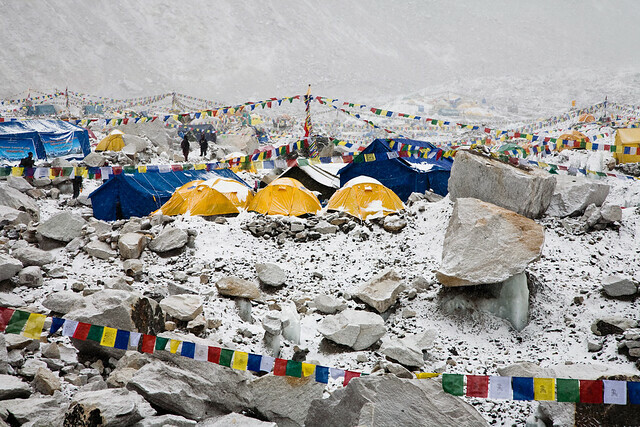 All of the climbers were wisely hunkered down in their tents and must have been feeling a bit disgruntled. All routes up the mountain were still closed as the Olympic torch team climbing from the Tibet side of the mountain had been delayed. 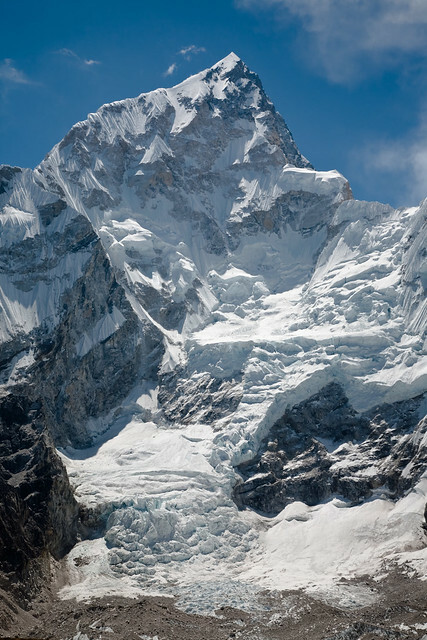 The major concern was that too much of the narrow weather window would be used up and that not all groups, who have paid huge sums of money to do this climb, would get the chance to even try the ascent. The good news is that as far as I could find out none of the groups missed their chance because of delays caused by the Olympic Torch. We camped that night at Lobuche and were happy to see clear skies the next morning. As we were now descending we were able to cover far more miles each day so our trip out would be much shorter. 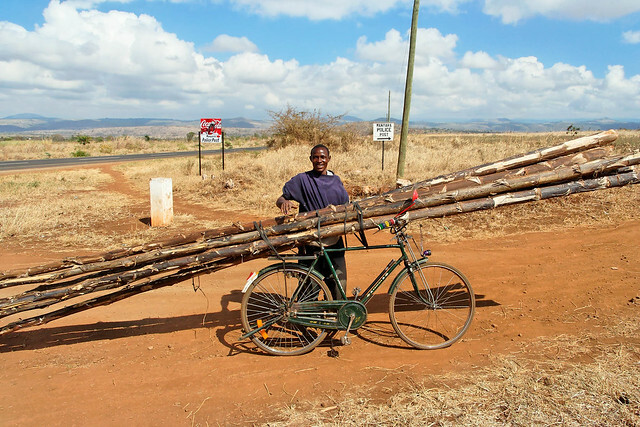 We noticed that our Zopkios started going to the area where they would be loaded up on their own accord rather than waiting for the drivers to lead them over and tie them up. They apparently knew the routine well enough to realize they were heading home now so they were anxious to just get going. 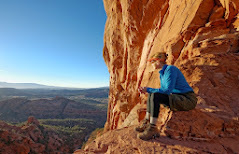 After we descended several thousand feet I was relieved to now be free of any altitude illness symptoms. Oxygen is wonderful stuff! 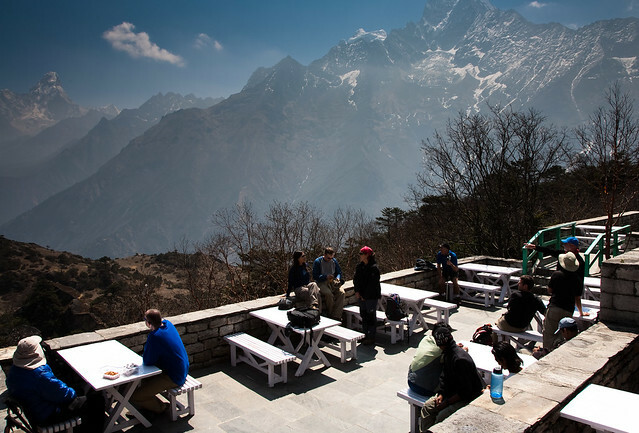 We continued to descend and thoroughly enjoyed our first sight of "green" as well as views of Ama Dablam (22,349 feet) and Amphu Gyabjen (18,471 feet). 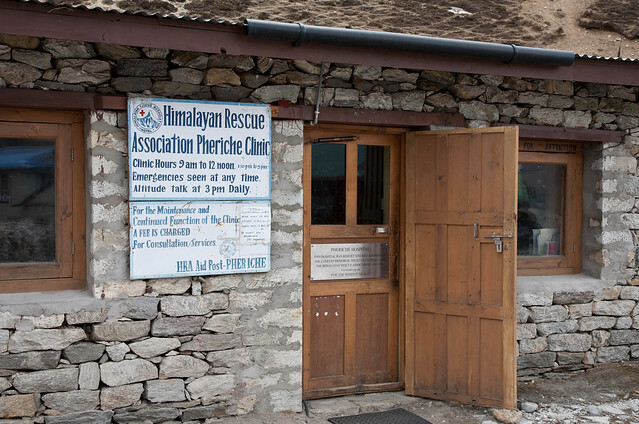 We stopped briefly in Pheriche and visited the Himalayan Rescue Association clinic, an important medical facility for trekkers, climbers and local people that is staffed by volunteer physicians. 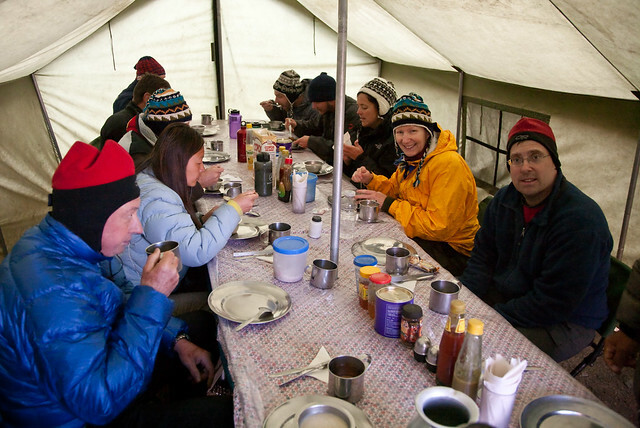 As we continued to descend to our next camp we encountered some rain and got pretty wet but it wasn't a problem as our camp was once again set up outside of a tea house. 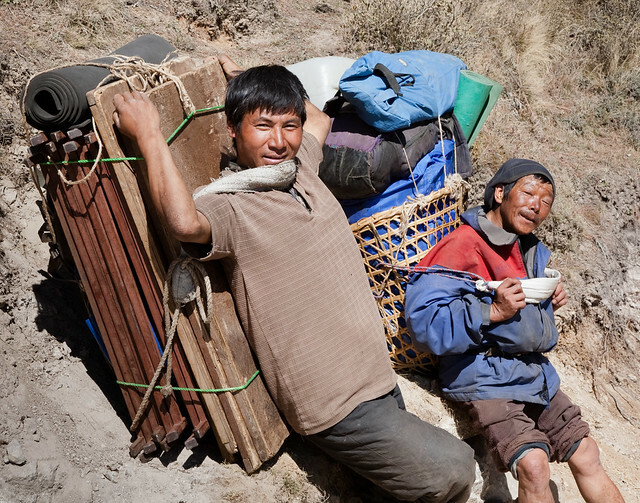 We all appreciated having a warm dry place to sit and dry our clothing (thanks to the stove that was fueled by "Yak patties" consisting of dried dung). The highlight of this day was meeting a group of silver haired ladies, including one who was 85, from New Zealand who were trekking together. As we hoped to visit New Zealand one day John happily engaged some of them in conversations about their country. The next morning was dry and we visited Tengboche Monastery before continuing our descent. Like the Zokios we were anxious to head down. Once again we passed through lovely Rhododendron forests. However, we did make a point to look back in order to get those last looks at the incredible mountains, such as Lhotse, that had been our constant companions for the previous week. The lower we went the better the trail became and the faster we walked. 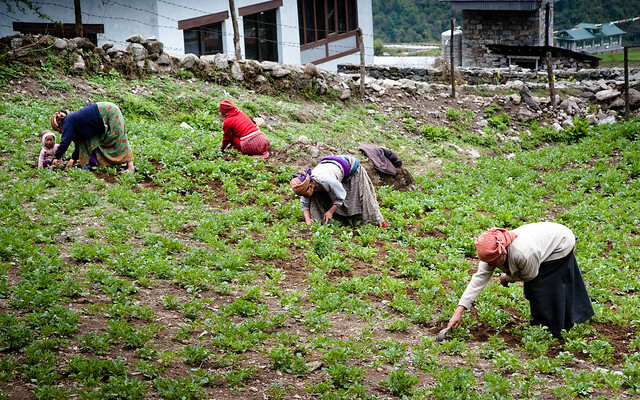 We were all motivated by the fact that we would be back in Namche that day and had been told that hot showers awaited us. ... and email both of our sons especially as Dan had just had a birthday. 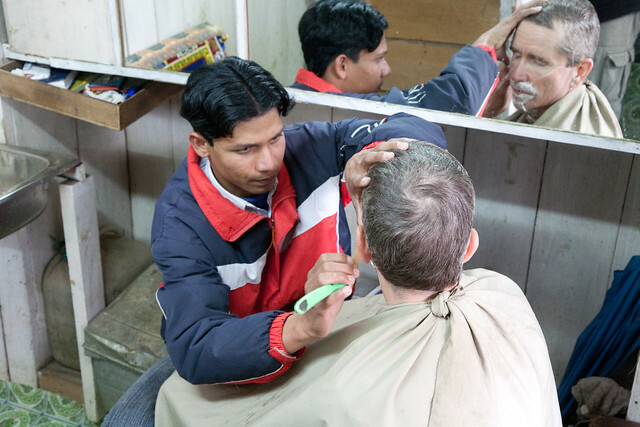 Our next stop was to the local barber where John got an impressively close (and bloodless) shave. 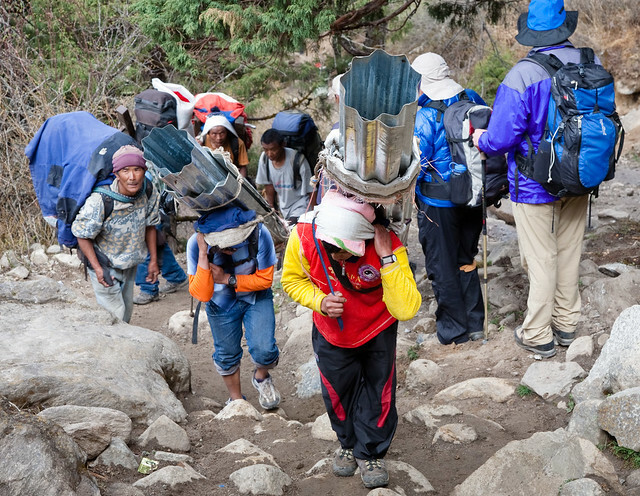 We also observed several of the porters from our group waiting their turn. 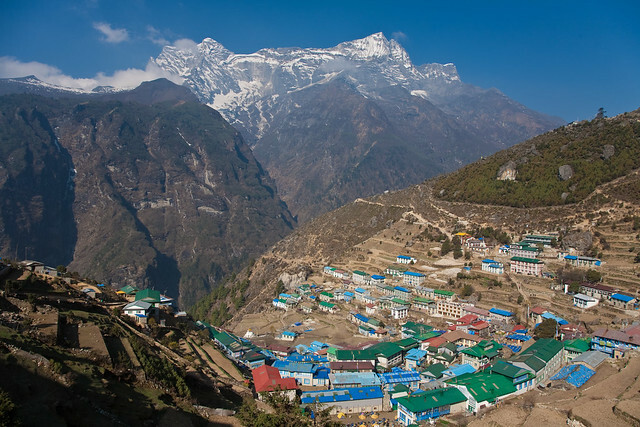 The next morning we left Namche Bazaar and descended back to Phakding where we had camped our first night. 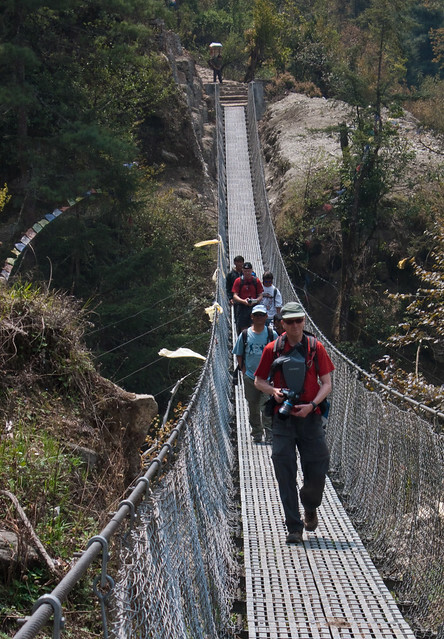 Once again we appreciated the substantial suspension bridges that crossed back and forth over the Dudh Koshi River. 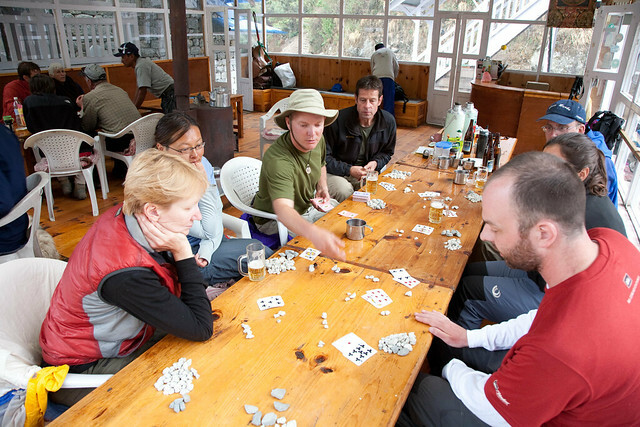 We arrived in Phakding rather early in the day and Larry, an inventive member of our group, organized a game of Blackjack using small rocks as currency. Having never played Blackjack I was surprised how long it took me to run out of rocks. 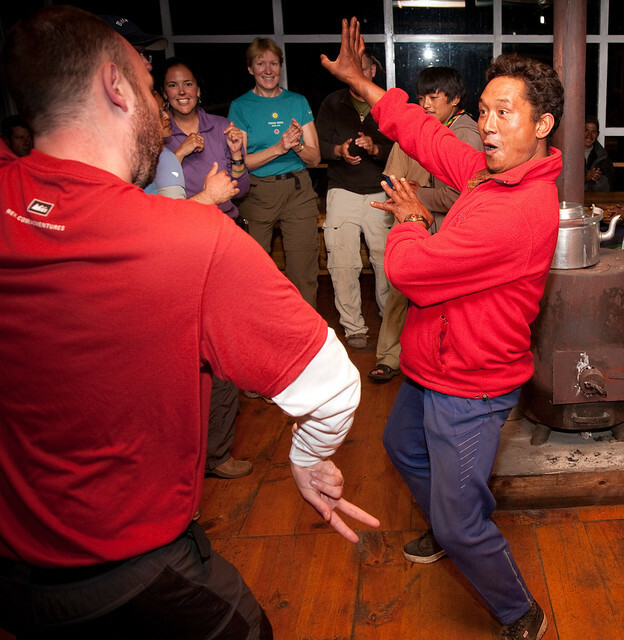 That night we had a party that included dancing (with some help of the local alcoholic beverage) as well as singing by the guides, cooks and porters. Apparently the expectation was that we would then sing for them but we had to let them down when it was determined that we didn't know any of the same songs. 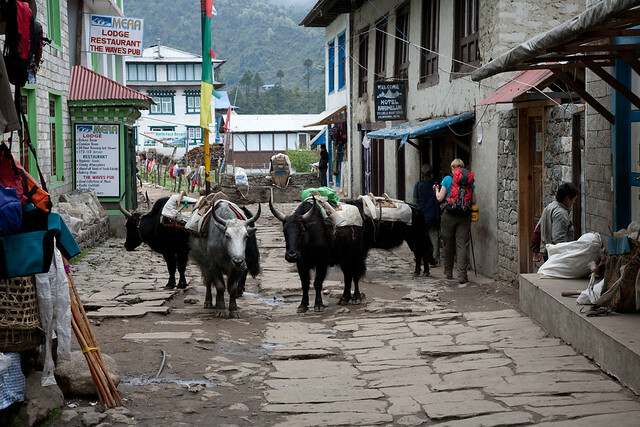 ... until we reached the "metropolitan" area of Lukla. This was truly a "trip of a lifetime". 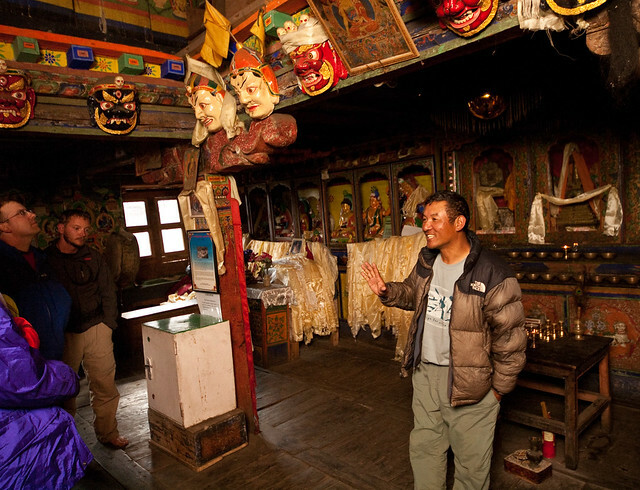 REI Adventures does an excellent job arranging this tour, Thupten is an outstanding guide and we simply could not have asked for better fellow trekkers. 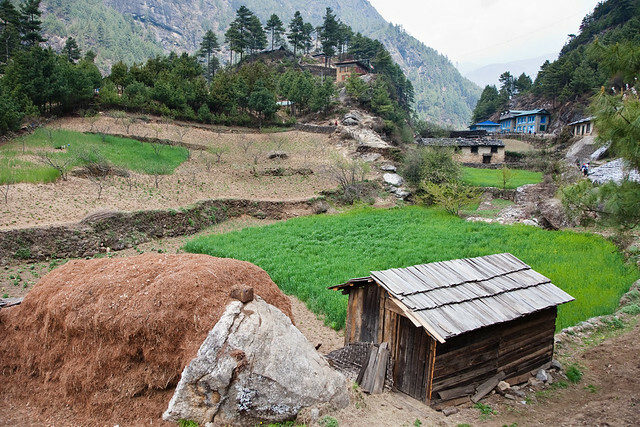 All of our Khumbu Valley Trek photos are on Flickr. 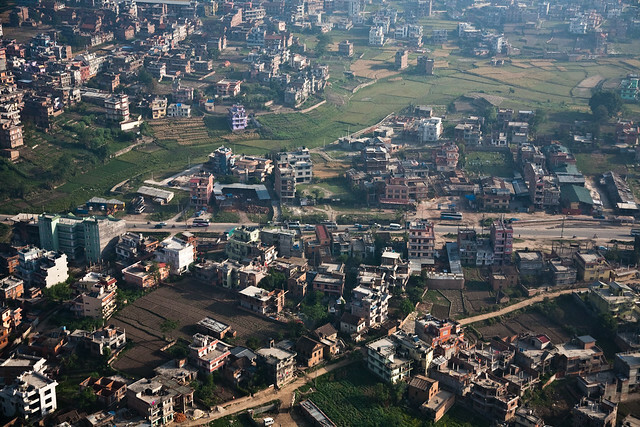 Once again we were lucky to have favorable weather conditions so we were able to catch a flight back to Kathmandu. In fact it was quite clear, so different from the low clouds we flew through on our flight to Lukla. 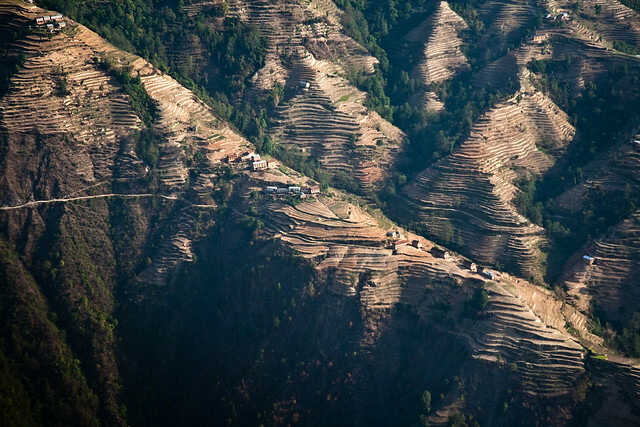 It was an impressive sight to see the multitude of terraced fields that were necessary in order to farm the steep terrain. As we had previously flown into Kathmandu at night this flight also provided us with our first views of the city from the air. 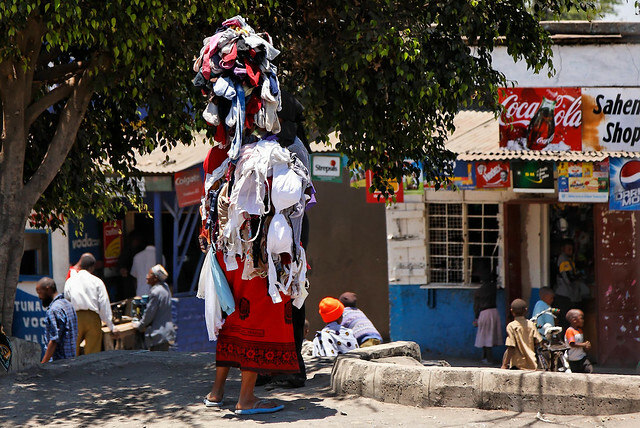 That night we took the opportunity to walk around the city and were approached by countless industrious street vendors. However, we just aren't "good tourists" and don't purchase souvenirs (largely due to our "Backpacker mentality"). 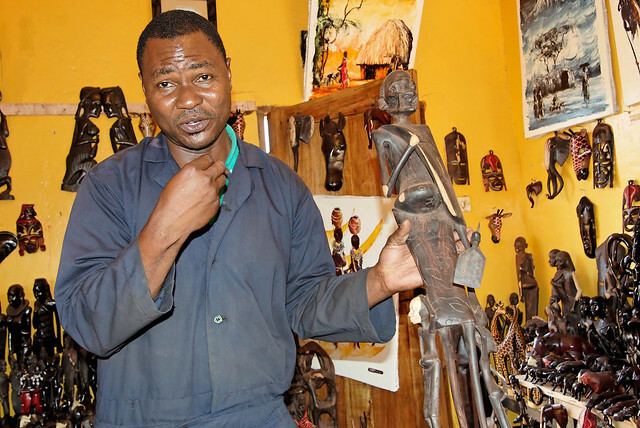 But I have wondered if I should have been offended when some of vendors approached John but not me. How could they be so sure that I wouldn't be interested in purchasing some Hash. 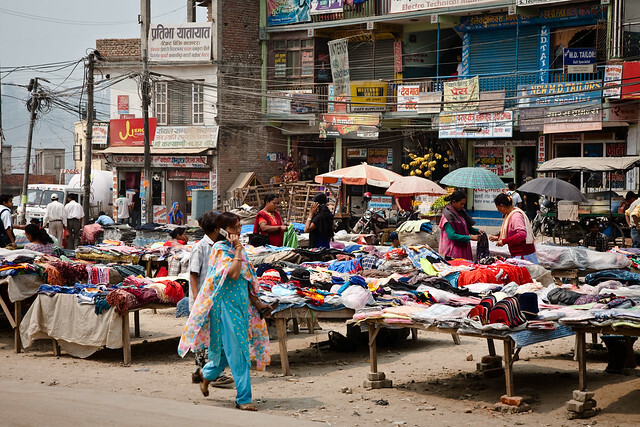 The next day John and I wanted to visit Bhaktapur, an older and less populated city, which apparently can provide tourists with a glimpse of what Kathmandu used to look like. Getting there was as simple as walking out of the gate of our motel and getting in the first taxi we saw. Once at our destination we tried to pay our driver. 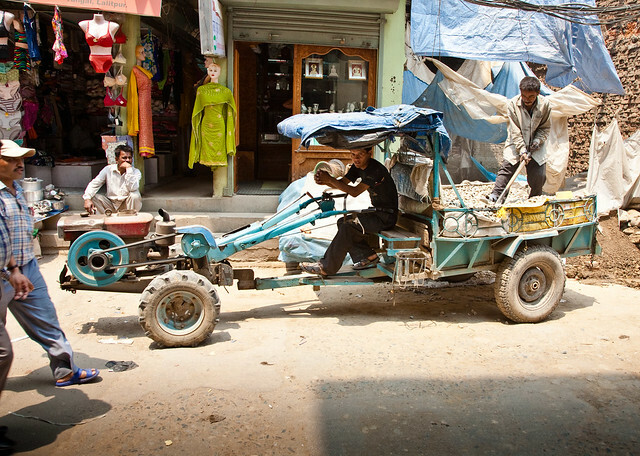 However, he refused payment and insisted he would wait for us and drive us back to Kathmandu. We told him we would be there for several hours but he insisted that he would wait. He then hooked us up with a guide who told us that his fee would be whatever we thought it should be. That is probably a wise policy as I imagine tourists often pay these personable and informative individuals far more for hours of their time then they would consider asking. ... and temples such as the impressive Nyatapola Temple. Many hours later we were tired and getting hungry again so we paid our guide and hopefully he was satisfied by the amount. We left the city at the same place we had entered and realized we could not remember what our taxi driver or his car looked like. We were faced with a parking lot full of vehicles and hopeful drivers seeking customers. However, we needn't have worried as our driver remembered us and quickly claimed us. 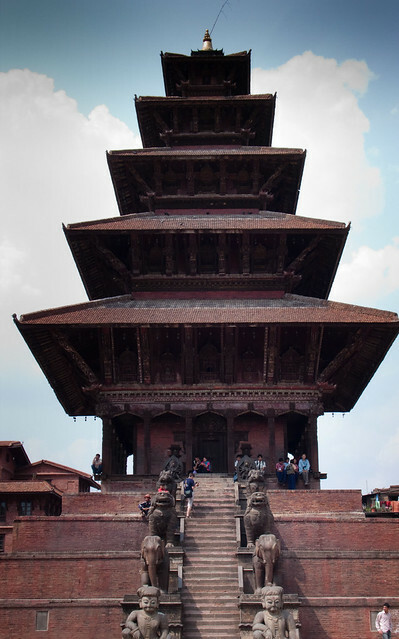 All of our Bhaktapur photos are on Flickr. 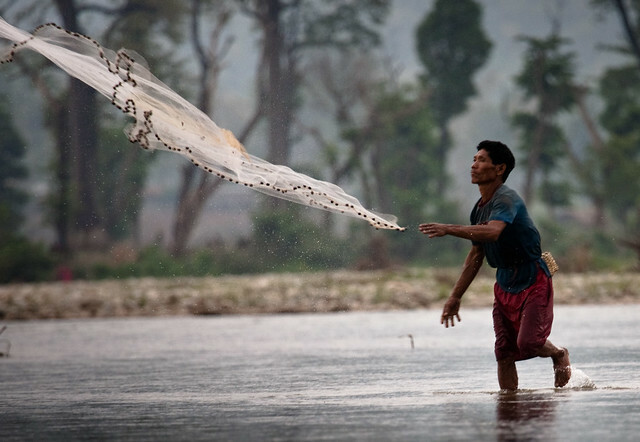 We then left Kathmandu to spend three days in Chitwan National Park located in Nepal’s southern flat lands. It’s a short flight from Kathmandu but we opted to be driven down in order to see more of the country. 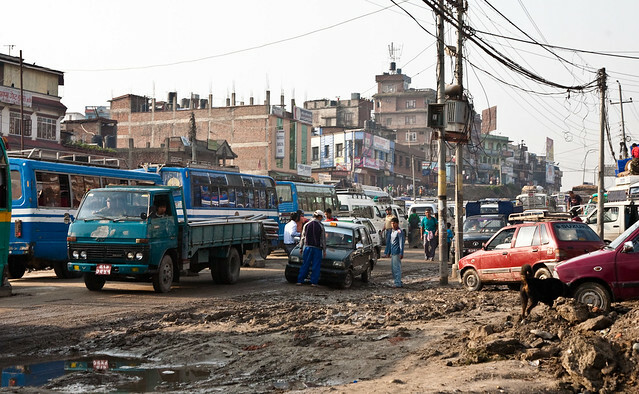 But first we had to get out of Kathmandu and traffic was heavy that day. 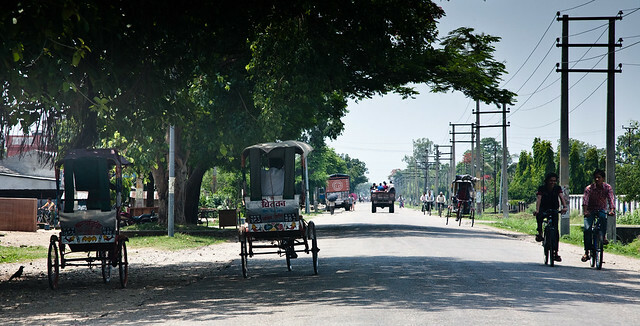 Our driver tried to find a way around it and as a result we got quite a driving tour of areas surrounding the city. At one point we were behind a vehicle that was stuck in the mud and our driver reluctantly helped push them out. He had some very shiny shoes that he was quite proud of and he meticulously cleaned the mud off of them before we continued. 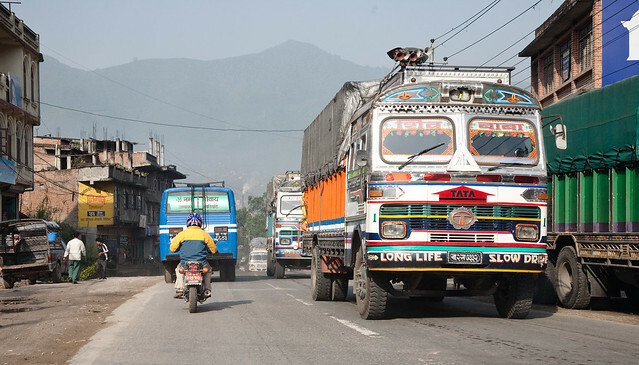 We eventually made it out of the city and began heading south on the Tribhuvan Highway. 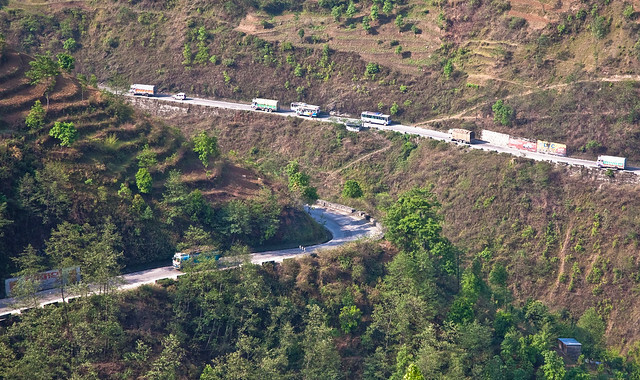 This highway is a major route between India and Nepal so traffic was quite heavy. As we were going down hill it was no problem but uphill traffic, consisting of primarily trucks and buses, was slow, smelly (due to diesel fumes) and noisy (due to liberal use of horns). We decided that our decision to fly back to Kathmandu was a wise one. As we got closer to our destination the terrain began to level out until we reached the flat lands in the southern part of the country. Quite a change from where we had spent the previous two weeks. 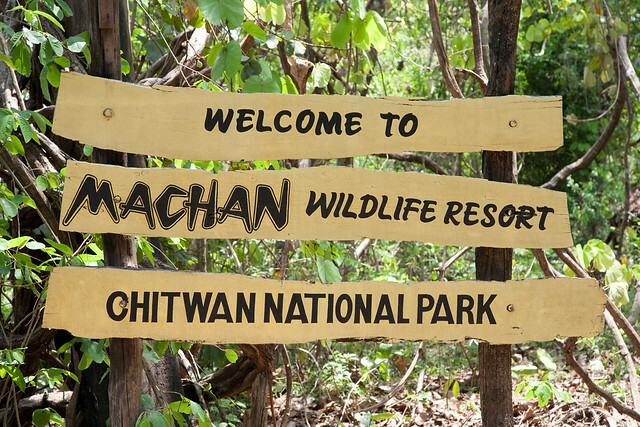 Our destination was Chitwan National Park where we would stay in a comfortable hut with luxuries such as indoor plumbing and solar heated water. 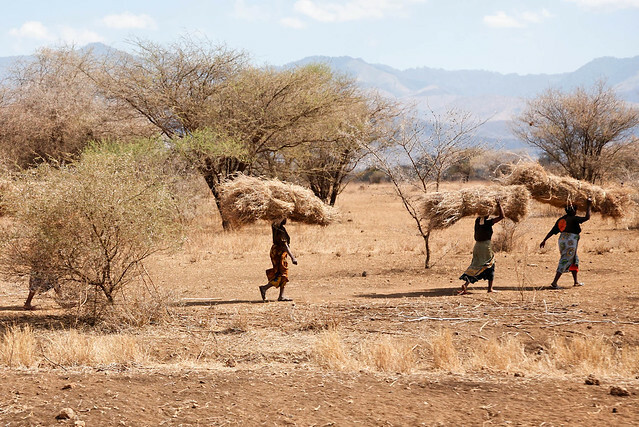 It is a remote area so we were grateful for electricity that was supplied by a generator twice a day; two hours in the afternoon so we could run the ceiling fan while we dosed on our bed before dinner and two hours after dark before going to sleep for the night. 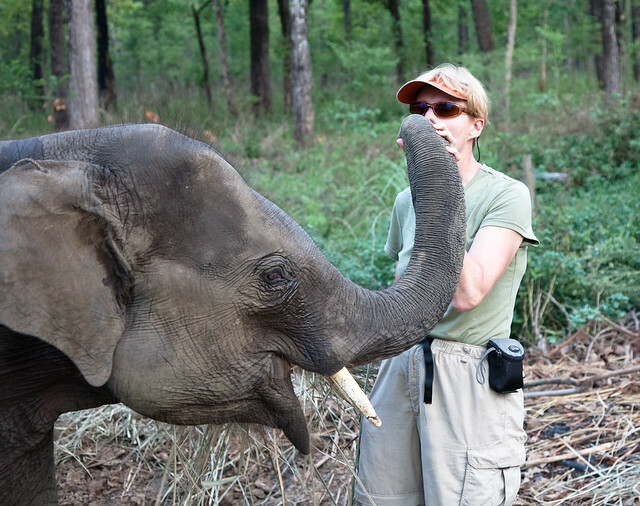 While there we would be provided with a variety of experiences and opportunities to view wildlife. 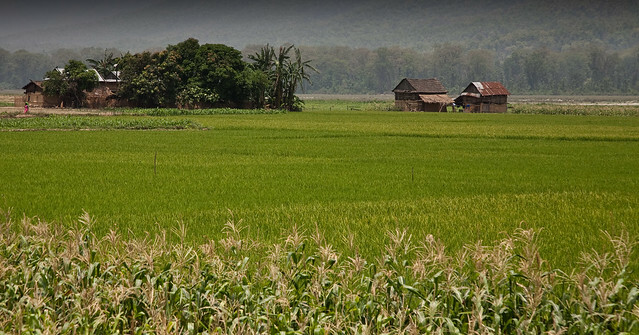 The area boasts a wide range of birds and mammals including the elusive Bengal Tiger. We were first taken on a jeep safari and saw quite of few birds and animals but the thick forest provided few good photo opportunities. When it was nearly lunch time we were all ready to head back to the lodge and everyone put their cameras away once we were back on a main road near park headquarters. 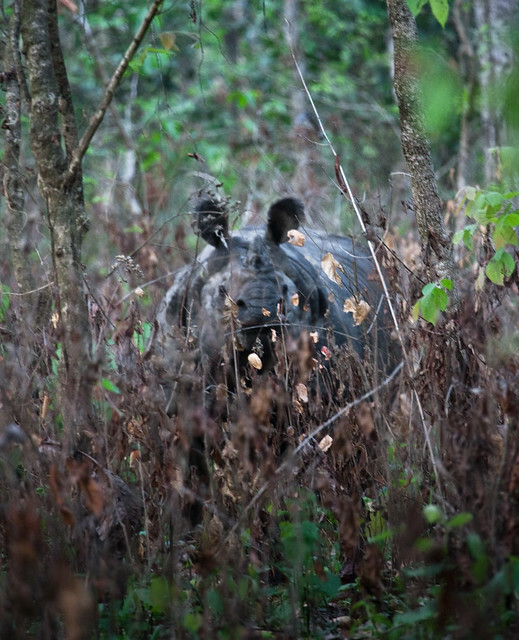 However, just as our jeep crossed a shallow gully and there was a break in the dense vegetation we all saw a huge One Horned Rhino standing within ten feet from the road. It looked at us briefly before quickly turning away and heading back into the woods. We all sorely regretted not having a camera ready. Our driver drove forward a bit, stopped, got out of the jeep and headed into the woods. We were uncertain what to do so we all got out and followed him. We thought he wanted to help us to photograph the rhino but I'm not sure if that was his intent as he seemed nervous when he saw how many of us were there in the woods with him. He did make a point of instructing us to get behind a tree if the rhino charged us which seemed like good advice. We followed the rhino a bit farther and John managed to get a photo that at the very least reminds us of the experience. 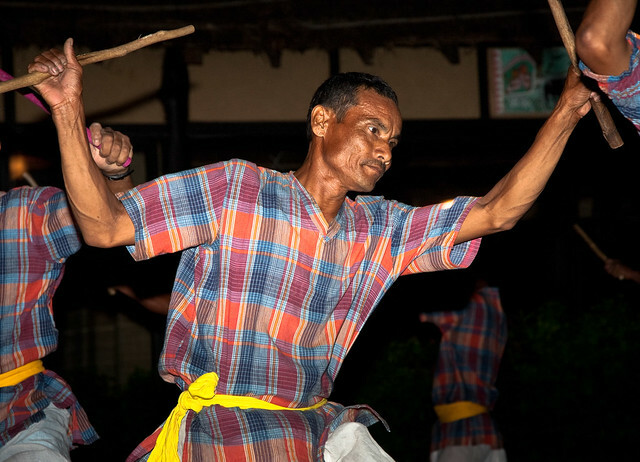 While staying at the lodge we were entertained one evening by some Tharu "Stick Dancers". 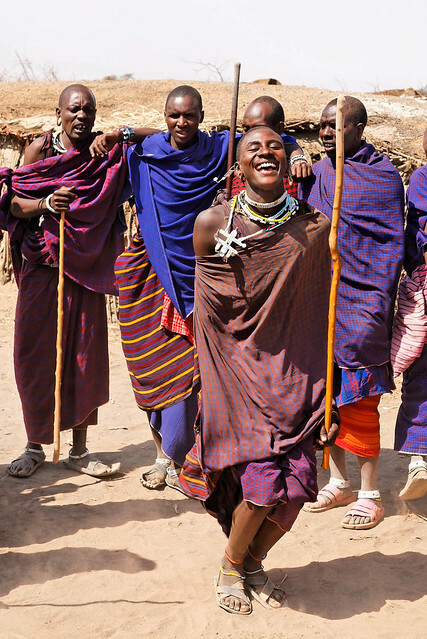 The Tharus are the local people and a group of men performed a traditional dance for us. It is an athletic and incredibly complicated dance that requires precise timing in order to avoid being hit by one of the sticks. 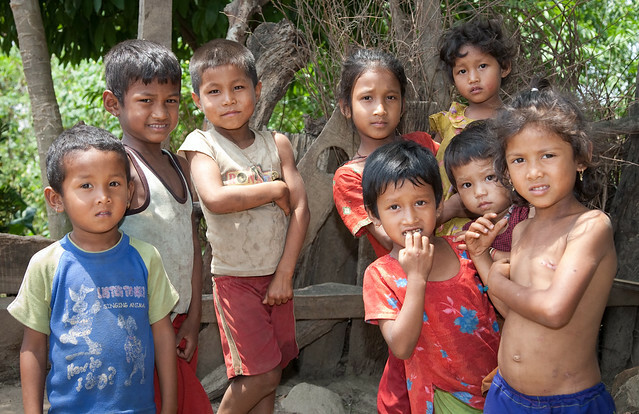 ... especially the children who loved to get their photo taken. 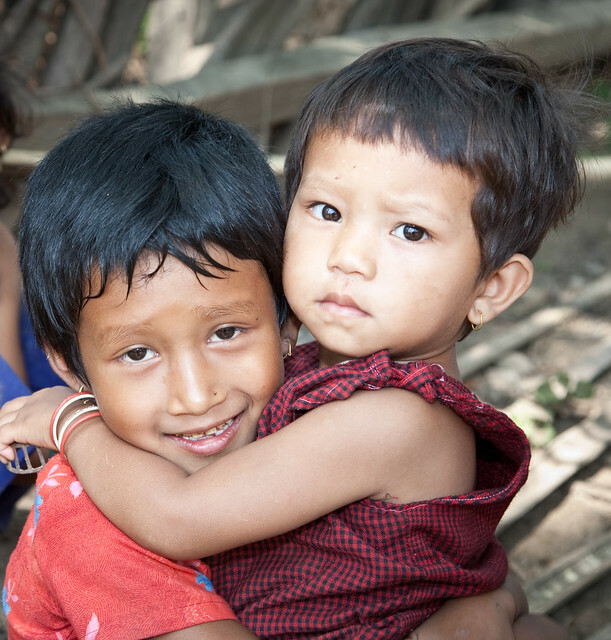 All of our Tharu village photos are on Flickr. ... and the safaris done on elephant back. 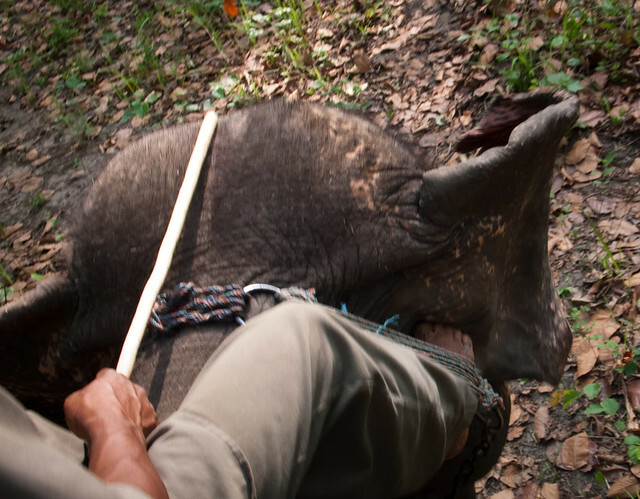 The "mahouts" (persons who ride elephants) use their bare feet to "steer" the elephant by nudging them behind the ears (a stick is also carried in case an elephant needs additional incentive). 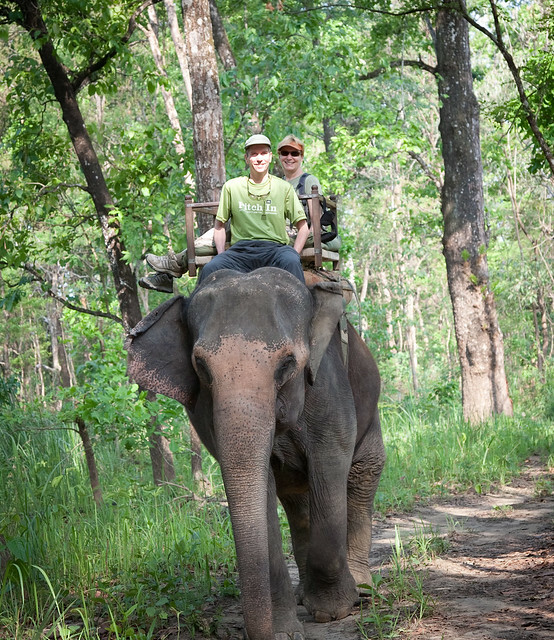 Wildlife sightings were few but it didn't matter as riding an elephant through the quiet forest was a great experience in its own right. In addition, we both got the chance to sit in the “driver’s seat”. 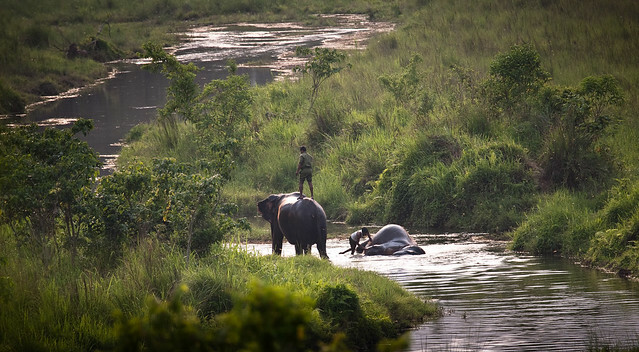 However, our mahout was always close by and I imagine the elephant knew the way home without any guidance from either of us but it was still great fun. John even got to sit up front all the way back to the lodge. 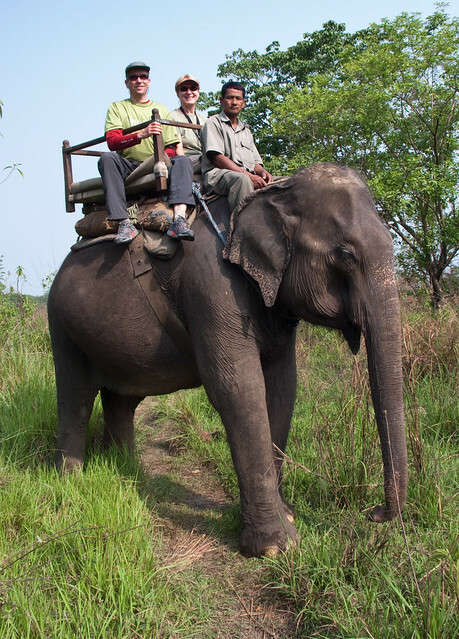 We have a short video from the "driver's" perspective while our elephant went down a short but very steep slope. John in the "driver's seat"
... including how the park breeds and trains their own elephants. 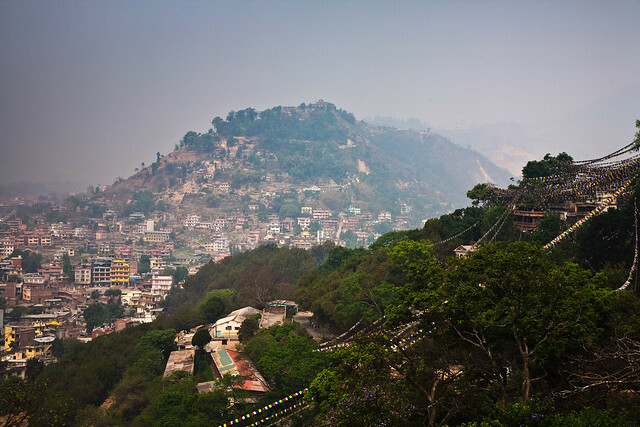 A short plane ride took us back to Kathmandu. 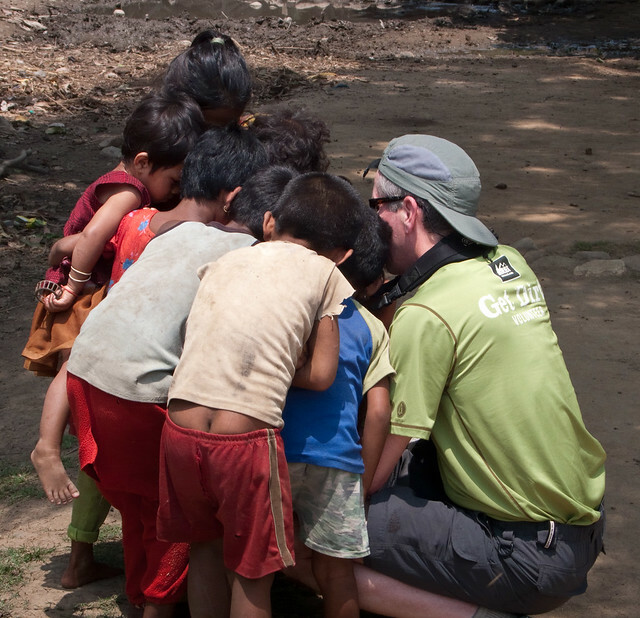 Our trip to Nepal was now coming to an end and we were ready to return home. But, there was one more adventure in store for us. We were to fly to Bangkok for an overnight layover before continuing on the long flights home. We were booked on the only Thai Airways flight of the day. The waiting room was crowded and uncomfortably hot but we waited patiently and were reassured by the sight of our plane sitting on the tarmac just outside. However, we began to get restless as the time of our departure came and went as there were no airline staff present at the gate and absolutely no visible activity around the plane. Another traveler went into the main terminal and eventually found an airport employee who would listen to his questions regarding our flight but his only response to every question was “I am not authorized to speak to you”. We didn't know what else to do so we continued to wait and felt grateful that we didn't have a connecting flight to miss as many of our fellow travelers did. We later learned that the crew was in the middle of an intense “Wildcat Strike”. Eventually, the pilot stepped out of the plane and gave a “thumbs up”. A gate attendant then appeared and we were happy to be hustled aboard. I have no idea what the issues had been but I took every opportunity to thank all of the crew for their willingness to get us to Bangkok. 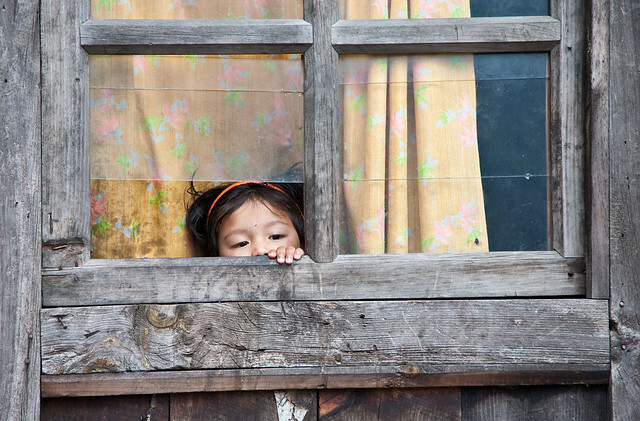 All of our Nepal photos are on Flickr. 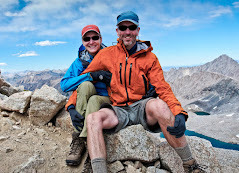 It is no secret that John has a great passion for photography and our current lifestyle, traveling fulltime and backpacking, provides him with almost endless opportunities. He has amassed a considerable body of work on our Flickr site and I use them extensively in this blog. 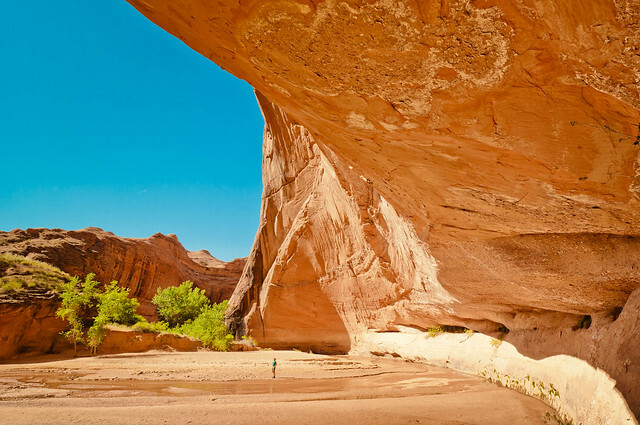 His primary focus is the incredibly beautiful landscapes and natural features that we have been so fortunate to have seen through our travels in seven different countries. He will also set up a tripod in order to get a photo of the two of us in some significant spot. 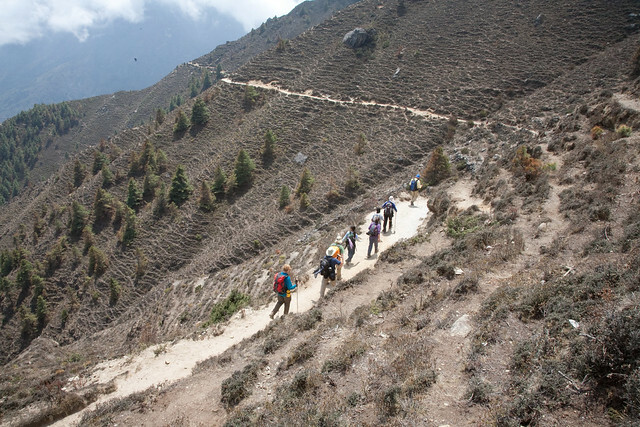 … and trekking in Nepal. 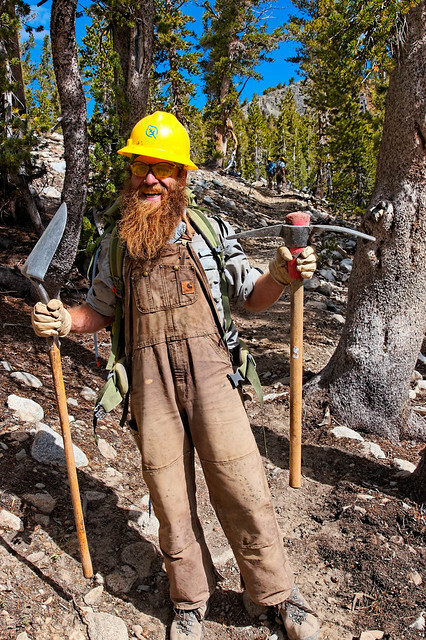 John will also photograph people we really appreciate such as hard working individuals doing trail maintenance. 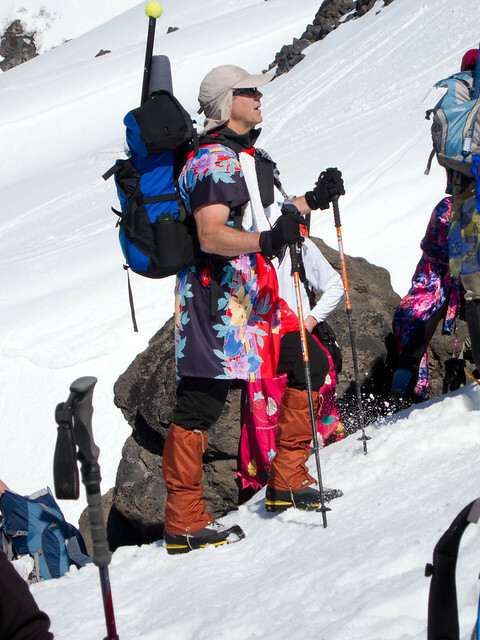 Then there are the people who have surprised us such as members of the Mazamas (a Portland Oregon based climbing group) who were participating in the annual tradition of wearing dresses while climbing Mt St Helens on Mother's Day. 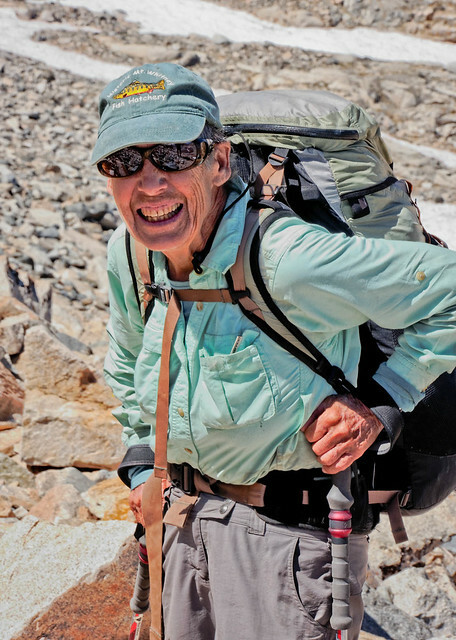 John can't pass up an opportunity to photograph someone who truly inspired us such as Carol who, at 77, was backpacking the entire John Muir Trail (she was 14 when she did it for the first time). 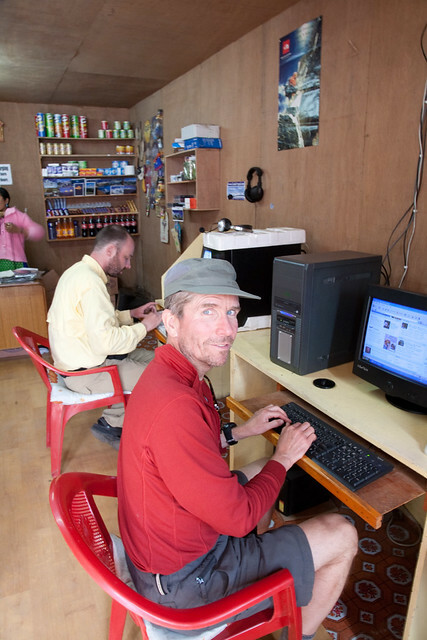 However, when I look at all of the photos that John has taken of people during our travels in Canada, New Zealand, Australia and the US within the past five years I can’t help but notice that he took far more photos of people during the five weeks that we spent during our trips in Tanzania and Nepal. I began to wonder who the people were and why had John taken their photos. 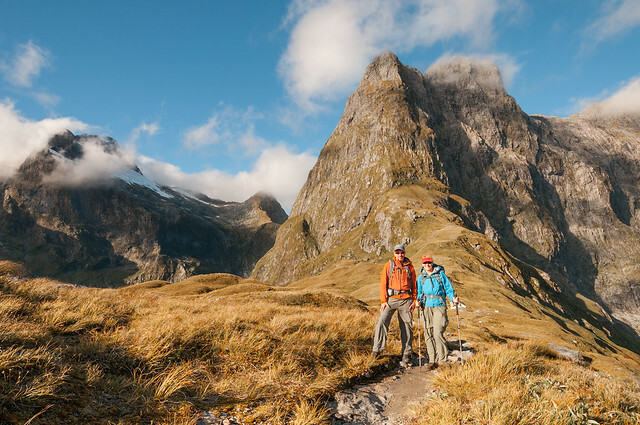 ... as well as spend an afternoon on MacKinnon Pass, the highest point on the famed Milford Track in New Zealand. 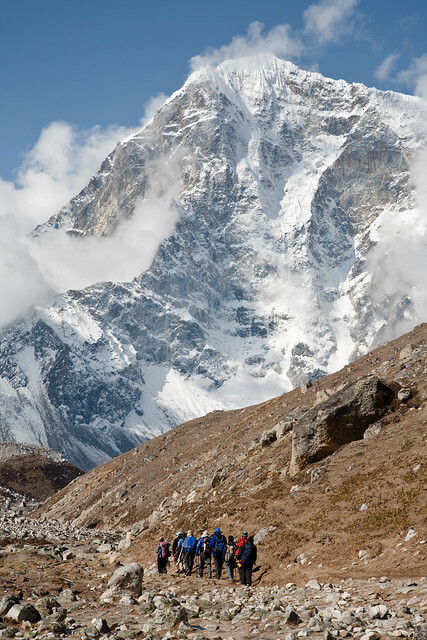 ... and when planning our trip to Nepal we wanted to trek in the Himalaya Mountains up the Khumbu Valley and see Mt Everest with our own eyes. The fact that both would require a considerable physical effort actually contributed to the appeal. However, we decided to make it easy on ourselves and did both of these trips as part of an organized tour operated by REI Adventures. 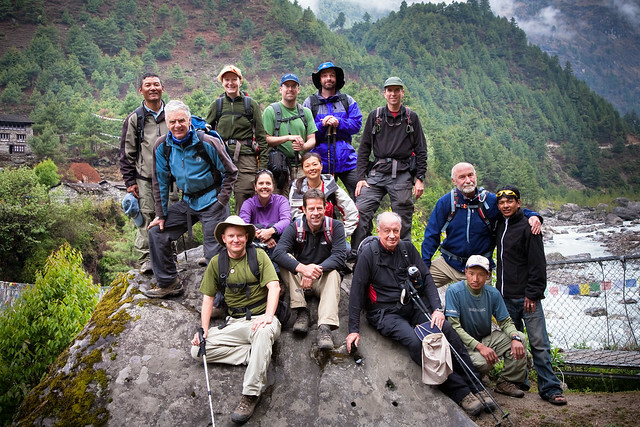 A major difference between these trips and those we have done independently is that both required a large "supporting cast"; guides, porters and cooks, in order for us to be successful achieving our goals. 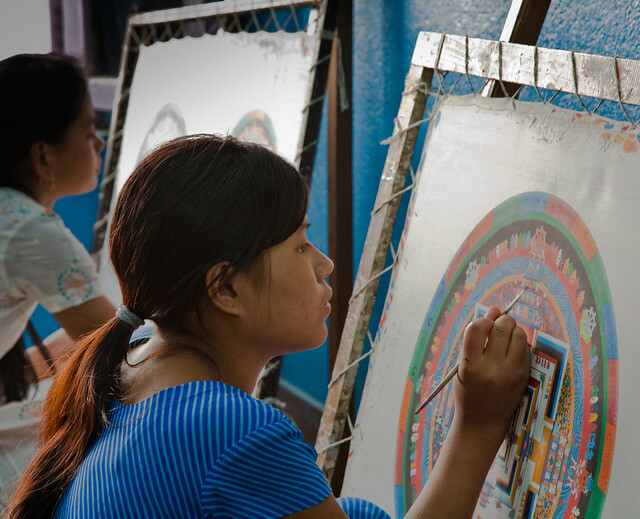 ... as well as their counterparts in Nepal. 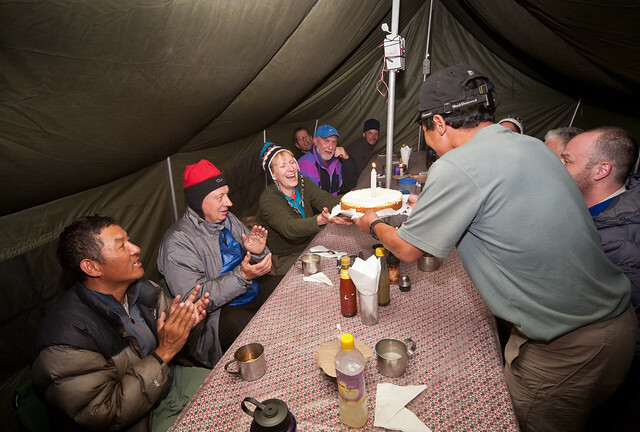 ... to being surprised with a birthday cake while trekking in Nepal. 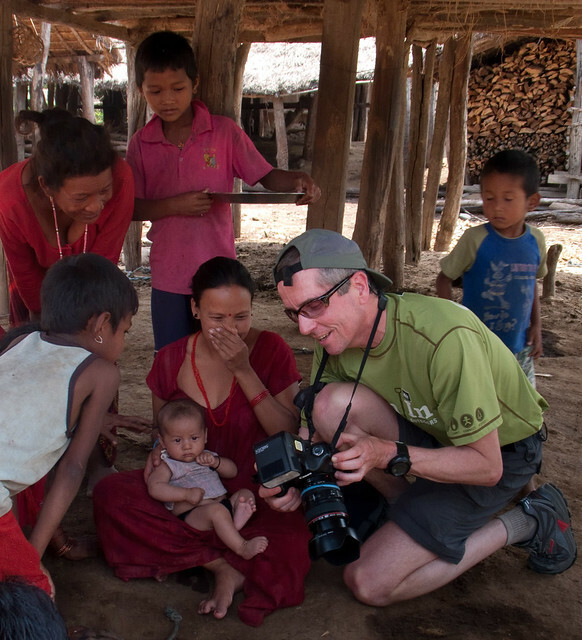 Once while camped during our Nepal trek John , in search of something to photograph, ventured into the cook tent and found that the cooks and porters were quite interested in seeing their own image on his digital camera. Something I realized is that while our guides and assistant guides were probably accustomed to being photographed this was apparently still a novel experience for these fellows. This created a surprisingly intimate interaction between them and I couldn't help capturing it. ... and wasn't shy about coaxing smiles out of them. 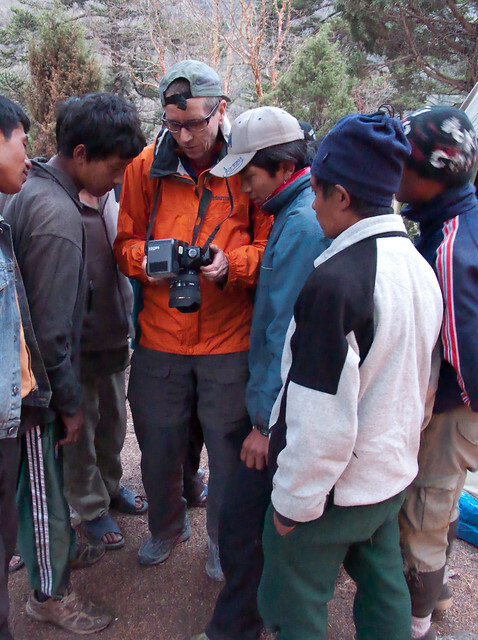 As with our porters, seeing themselves on the digital screen of his camera was apparently a novelty. 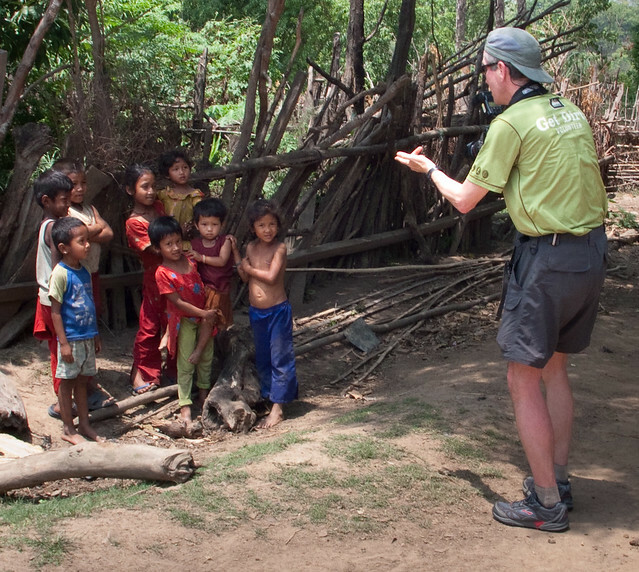 While the adults needed coaxing the children needed none because they loved to have John take their picture. ... but as soon as he was done they would race over and crowd around him. Each time he would zoom in on the image and scroll around so that each child could see themselves close up. 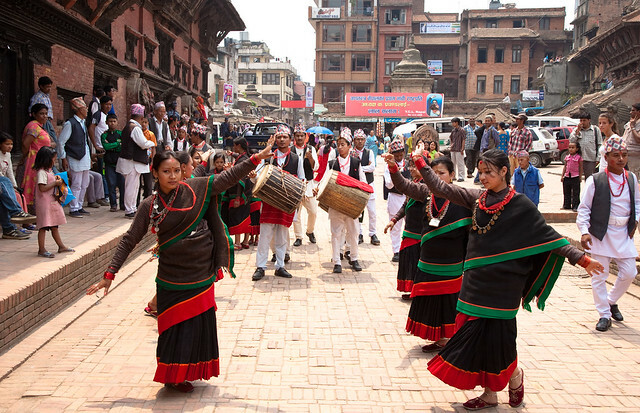 ... and these street dancers in Patan, Nepal. 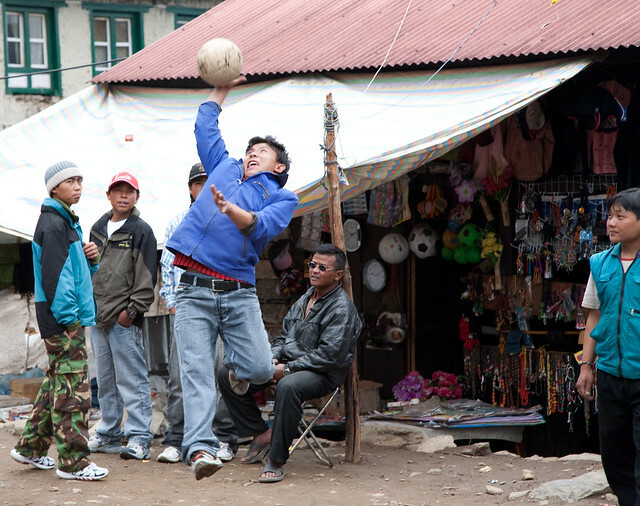 ... that was completely different from the broader faces of the Sherpa people we saw most often. 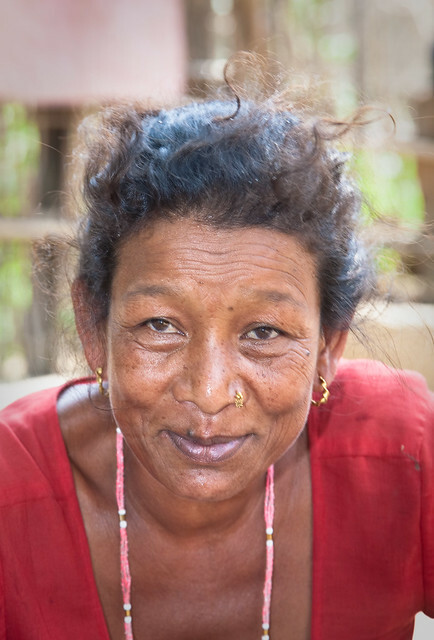 I wasn't surprised that John felt compelled to photograph this attractive young woman while we were visiting the Tharu village in Nepal. ... no matter where in the world they live. Since all of the above photos taken in Tanzania and Nepal came about because of our being on organized tours the obvious reason that we don't have corresponding photos from our travels in Canada, New Zealand, Australia or the US is that it is possible for us to always travel independently. 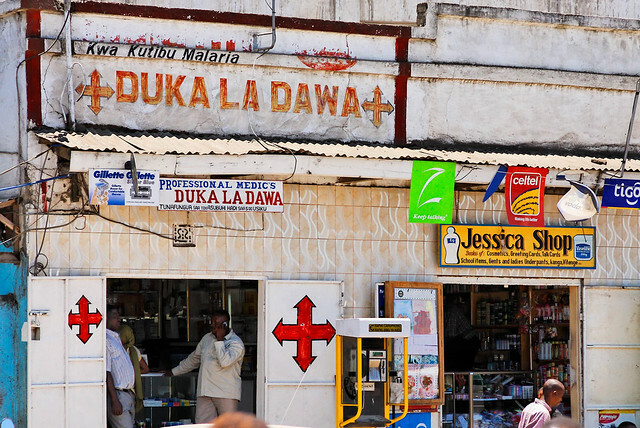 We also typically avoid crowds, tours and cities like the plague but while on the organized tours in Tanzania and Nepal we spent more time within urbanized areas. We were around more people and didn't think twice about taking photos of them. After all, international tourists have been doing the same thing for as long as there have been cameras. However, the internet has changed everything when it comes to what happens to photographs especially photos of people. Generally speaking in the past, travel photos went no farther than family photo albums and slide shows. But now, it is possible for them to be viewed anytime and anywhere in the world by anyone who has internet access. 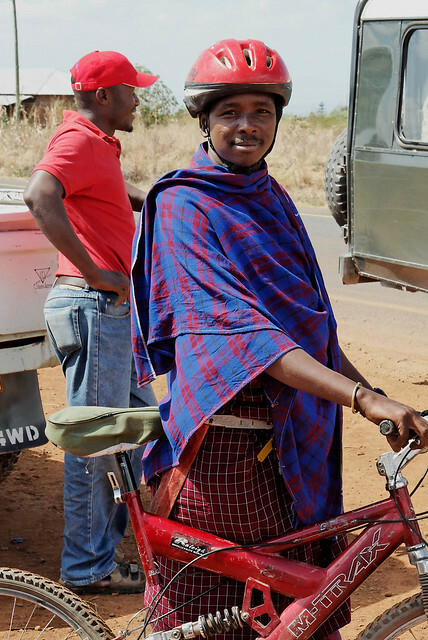 Despite that fact, we didn't think twice about posting photos that John took of people in Tanzania and Nepal on our Flickr site or using them in our blog. We have occasionally asked individuals for permission to take their photo (or their child's photo) although frequently that just isn't feasible. However, we have never asked anyone if it is okay to then post that photo online. I think it is a reasonably safe assumption that most westerners understand the possibility of any photo taken in public showing up somewhere so they would say something if they had an issue with it. 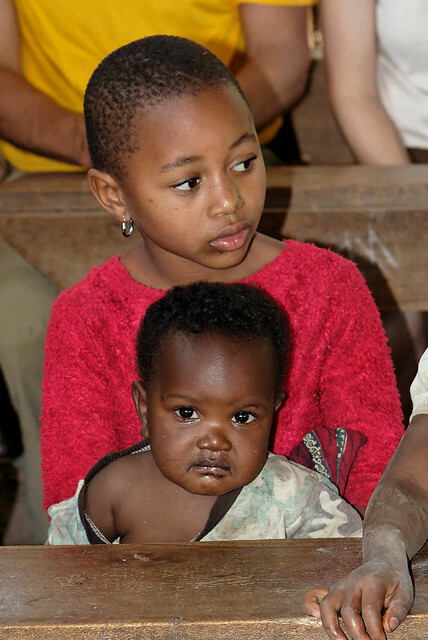 But would every Tanzanian or Nepalese in our photos have the same understanding and feel comfortable objecting? One thing to keep in mind is that, with the exception of the bystanders watching the street dancers and the street dancers themselves, we had a personal connection with the people in the photos above and they benefited by our presence, primarily financially (through wages, tips, donations, purchases etc). I think it is a reasonable assumption that they understood the importance of keeping tourists happy so would not only given their permission to take their photo but to post them on the internet as well. ... then why wouldn't it be drawn to these equally graceful forms? ... doesn't it stand to reason that he wouldn't want to miss this opportunity when presented with it? ... is it any surprise that he felt compelled to capture that same sense of anticipation when he saw it in this lovely child's face? ... so is it any wonder that he would not pass up the opportunity to capture an equally radiant sight? 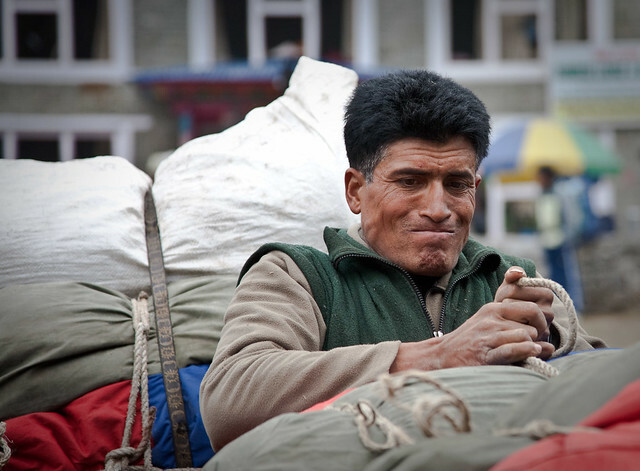 A while back I found a post on the Digital Photography School's website titled Photographing People When Traveling,. The subtitle of the post says it all, "People are not Sites". I interpret that to also mean that people should not be viewed as just part of the "landscape". But what I believe, and I mean this in the most respectful way possible, is that the people in some of his photos ARE the landscape, that they are beautiful natural features contained within our amazing natural world. But does this justify our posting them on Flickr and our blog without their expressed permission? I don't know. All I can do is try to put myself in their place but it is difficult as I seriously doubt that anyone, other than John, would want to take a picture of me. What I can do is try to imagine how I would feel if someone got some of John's photos with me in them off of our Flickr site and posted them on other sites without my permission. It ends up that I didn't have to use my imagination as I discovered that individuals on micro blog sites such as Tumblr and online "bulletin boards" like as Pinterest have been selecting some of John's photos for their pages. I was surprised to see that several of them had me in them. 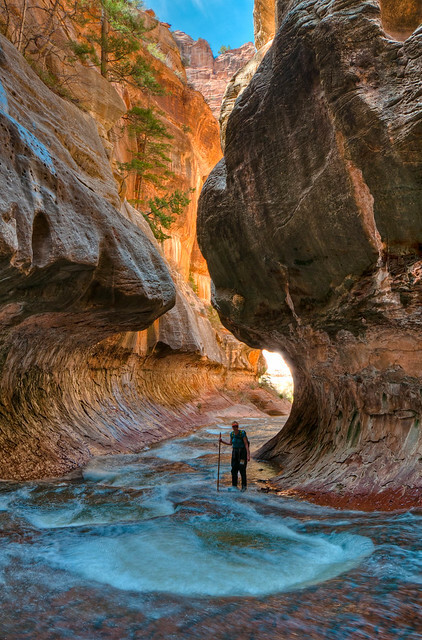 For example, the photo below of "The Subway", a slot canyon within Zion National Park in Utah, has been "liked", "reblogged" and "repinned" innumerable times. But as far as I can tell these photos are only being used to illustrate someplace that the "Reblogger" and "Repinner" hopes to see for themselves one day (although I did inadvertently discover that this photo was the only landscape photo on a site that was predominantly photos of attractive young men in various states of undress and engaged in intimate acts and I am unsure as to why). I realized that none of the photos other people are posting on their sites are of me, I just happen to be in them providing "color and scale". However, in the very unlikely event that anyone actually does use a photo that was of me I hope that they do so with the same sense of respect and admiration that we feel for the individuals in John's photographs. If that ever happens then I think I would be very perplexed but I would also feel flattered. My sincere hope is that the people John has photographed would feel the same. ... doing the mundane tasks that they do every day. 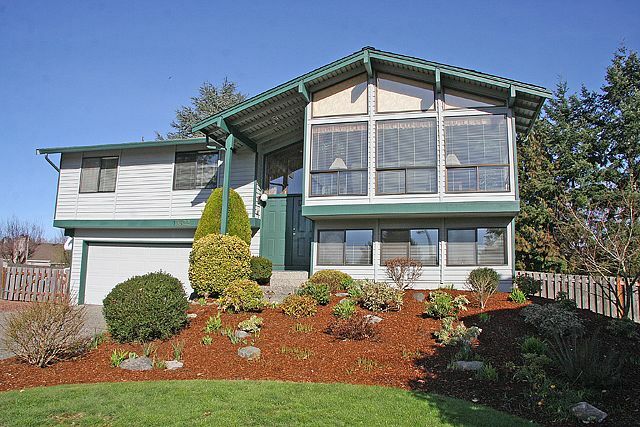 ... stopped in front of our house while I was busy working in our front yard; mowing the grass, pulling weeds or spreading “Beauty Bark” in between the shrubs that I just pruned etc. How would I have felt if they snapped a few photographs of me. I'm pretty sure I would be annoyed, maybe even angry especially because I would have been sweaty, dirty and wearing old clothes. At the very least I would be perplexed. I would wonder what it was that they found so interesting about what I was doing. After all, I was only doing yard work, something that most people in the US who has a yard spends an inordinate amount of their free time doing. ... they would still wonder why we didn't use the entire area for crops. 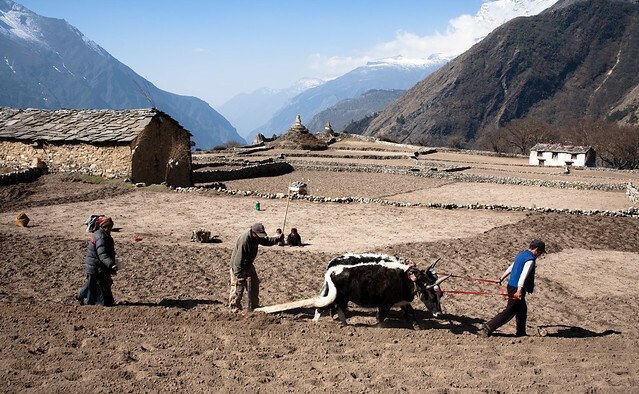 That much flat land is almost nonexistent in the Khumbu Valley and farmers have had to laboriously build terraces in order to have even that much. 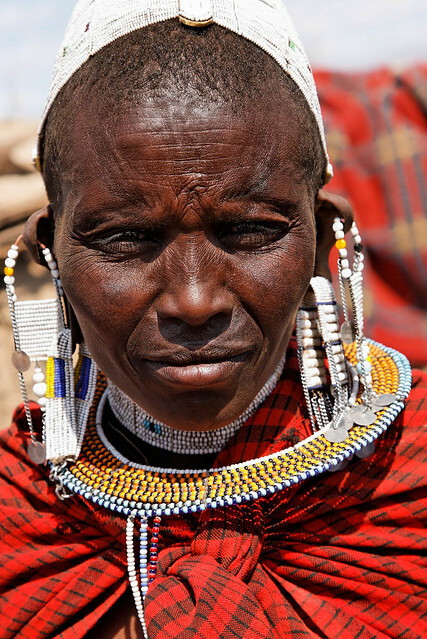 It would be a humbling experience to see one's self through the eyes of people who live in non westernized countries and know first hand how they view our culture and lifestyle. But secondhand information is telling. 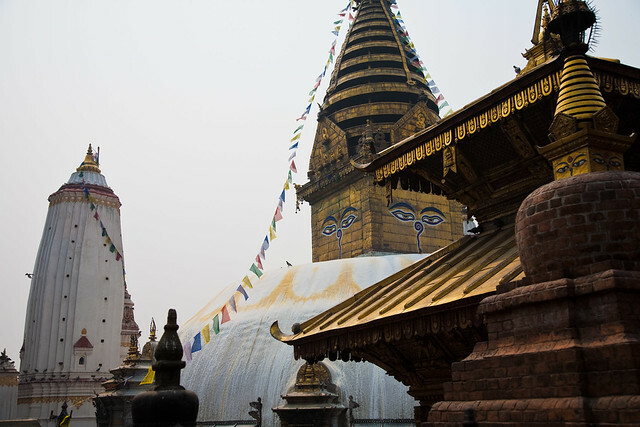 One of our tour organizers in Nepal told us about a time when his son traveled to the US. He had some difficulty recognizing a typical bathroom or restroom in the US as the room with the toilet. It simply looked too clean and didn’t “smell right” (not to mention the fact that it was located smack dab in the middle of the house rather than well away from it) . And a friend once told me of an observation that had been made by an exchange student from Kenya. 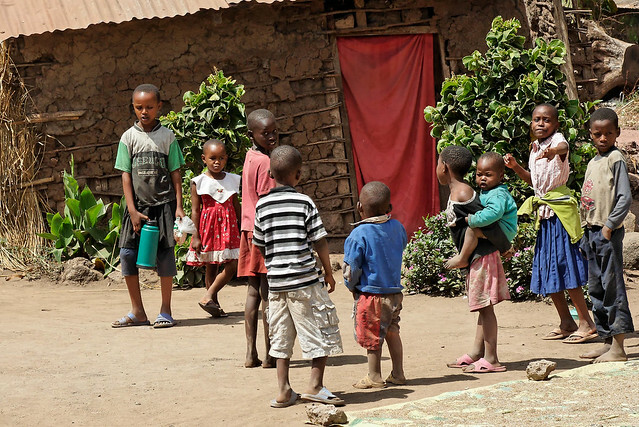 He told her that he thought that Americans must be the laziest people in the world because we have doors that open for us when we walk up to them, toilets that flush automatically and we only have to wave our hand to have paper towels dispense. ... that they don't need mortar. ... and children as well. ... rather than in an economically challenged country. I have to admit that I have indulged in useless"white person guilt" more than once but I realize a more positive attitude is to simply appreciate being born where I was (not to mention when I was as I do enjoy being able to vote). I just wish that every westerner, especially Americans, could have the same opportunities that we have had to see how other people in the world live. Perhaps it would help some of the many Americans who are unhappy and generally dissatisfied with their lives to appreciate all that they do have. I am reminded of the fairy tale, “The Fisherman and his wife”. In short, a fisherman and his wife live in a hovel by the sea. One day he catches a magical fish but releases it. However his wife insists he catch it again and ask the fish to grant a wish; for their hovel to become a small cottage. The fish grants this wish and the wife is initially quite happy with her new cottage. However, she soon becomes dissatisfied with what they have and insists that her husband catch the fish over and over in order to ask the fish for greater and greater things; to live in a castle, to be made a king, then an emperor, and then pope. Each time the fish grants her wish...until the fisherman’s wife demands to be like “God”. At this point the fish refuses to grant her wish and tells the fisherman to go home where he will find his wife back in their hovel. So I’ve been working on my “attitude of gratitude”. 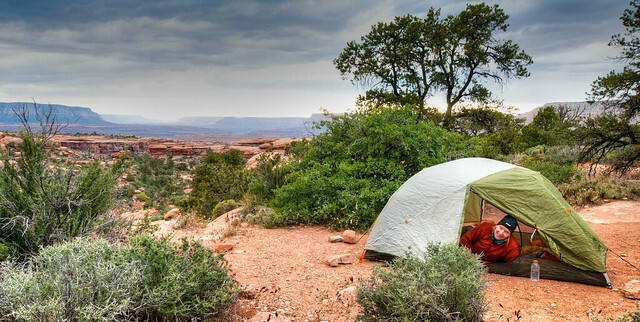 Fortunately for us, our "backpacker's mentality" always enabled us to think of the big house that we used to live in as a "palace" and we never felt a need for anything greater. In fact our idea of a good time was to "live" in our tent whenever possible. And even though our motorhome by US standards is considered to be "modest" in size it feels palatial to us especially after we return from a backpack trip. But there are so many luxuries that I have taken for granted (and there are too many that I have even been known to complain about). And I believe this is the reason we have so many photos of people in Nepal and Tanzania who are simply living their lives. We have these photos to help us to remember how we felt during that brief period of time when we were fortunate enough to be allowed to have that glimpse into their lives. We want to remember to count our many blessings each and every day. 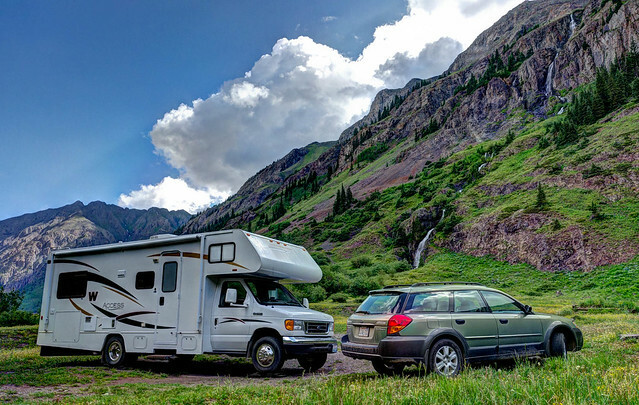 We are so appreciative of wide paved roads and highways (with well marked lanes) as well as stop signs, traffic signals and sidewalks (especially since we began living and traveling full time in a motorhome). ... including fresh produce all year round. ... as well as small privately owned shops and everything in between. However, our preference is to order items online so we marvel at how easy it has been, given our mobile lifestyle, to have internet access and arrange to have our items to be delivered to us via the US Postal Service and UPS. We are also grateful for health insurance and access to good health care and before too long, Medicare and Social Security. And we have two big reasons to appreciate our public education system and child labor laws. I can’t imagine how we as a society would manage without such marvels as recycling, trash collection, landfills, sewage treatment facilities, not to mention those wonderful public toilets! ... and even do our laundry! 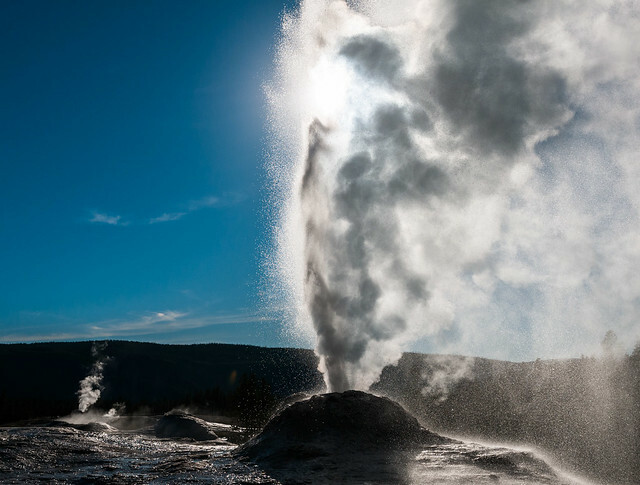 ... that flows through pipes right to our home. Last, but in no way least, there is that wonder of wonders, that miracle of miracles, hot water, right out of a tap! All I can say is if a hot shower doesn’t make a person feel like a “king” perfectly content in their “castle” then I don’t know what will!